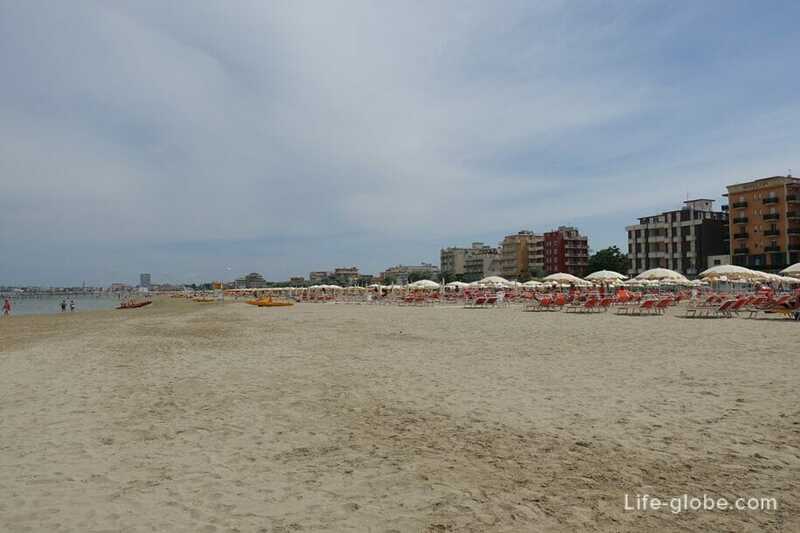 Rimini - the largest and, to date, one of the most visited resorts on the Adriatic coast of Italy. 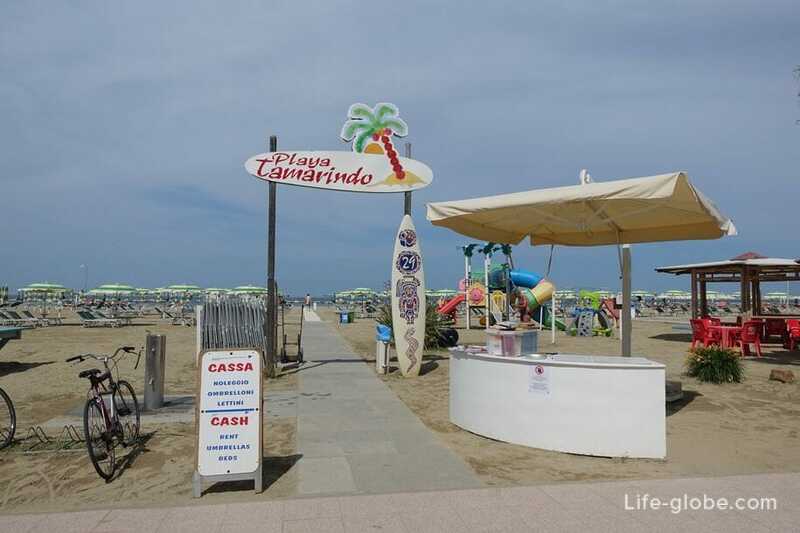 Rimini attracts tourists, first of all, a developed beach holiday. 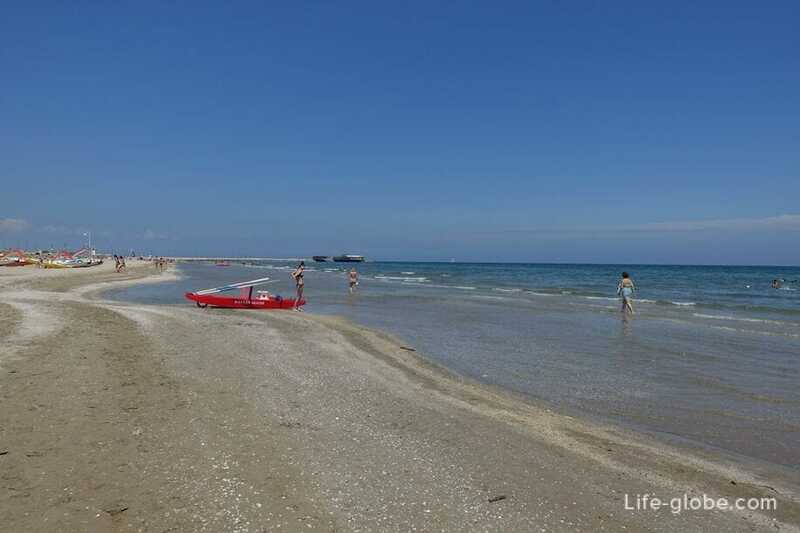 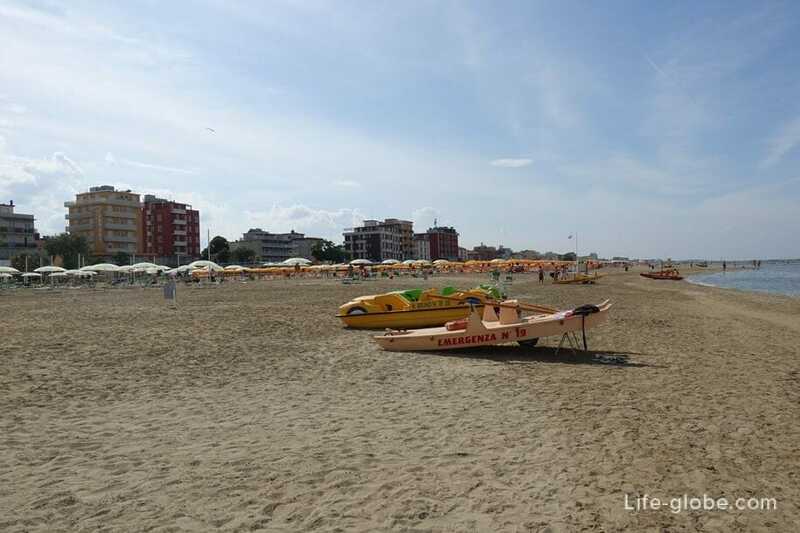 The length of the beaches Rimini is just over 15 kilometers, representing almost one beach. 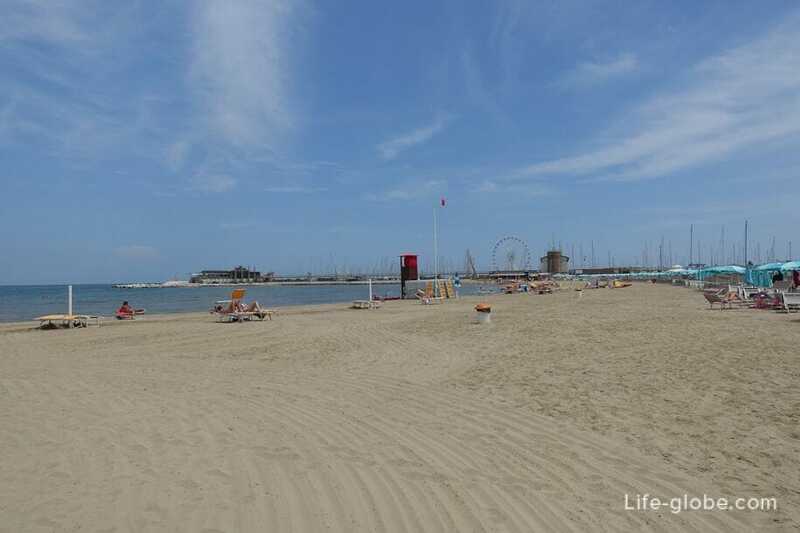 All the beaches of Rimini are divided into South and North, which shares a Maritime port with a yacht Marina. 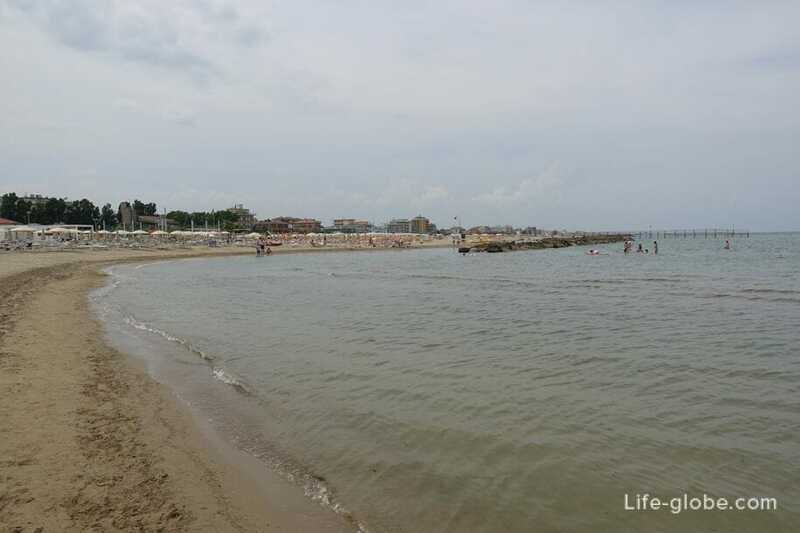 Those beaches located to the South of the port belong to the Southern beaches, and those for the North side of the port to the Northern beaches. 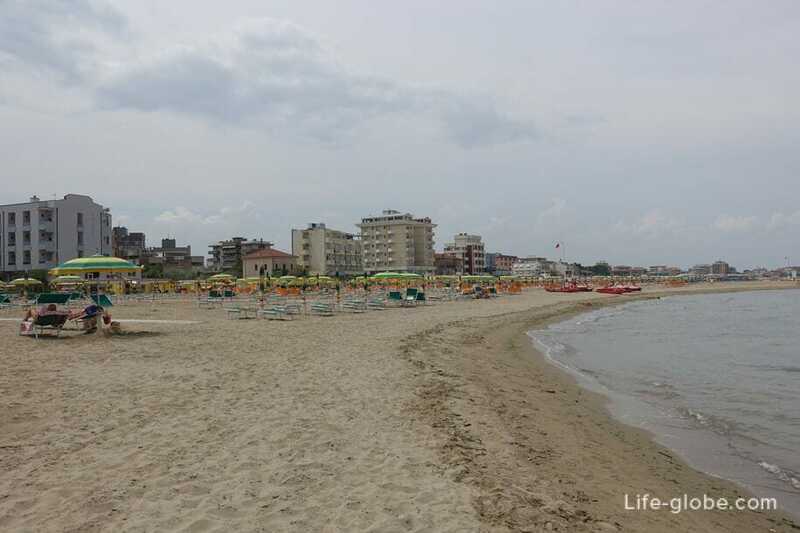 The beaches of Rimini (North and South) is divided into ten districts, nine of which, in turn, are also divided into smaller beach areas on the numbering. 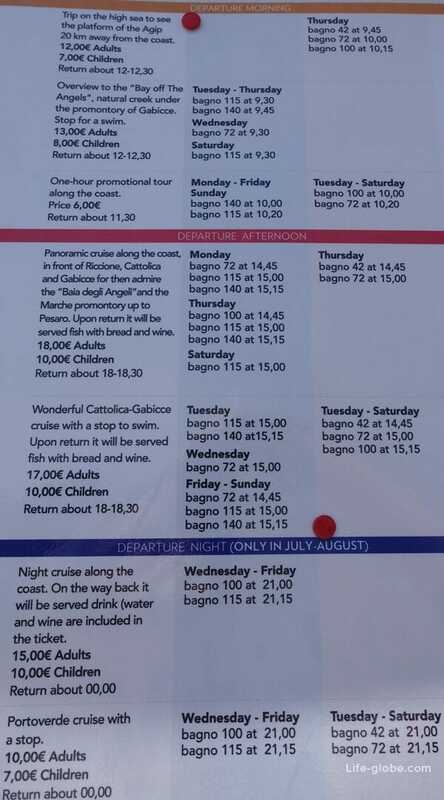 - Miramare, numbering from 131 to 150. 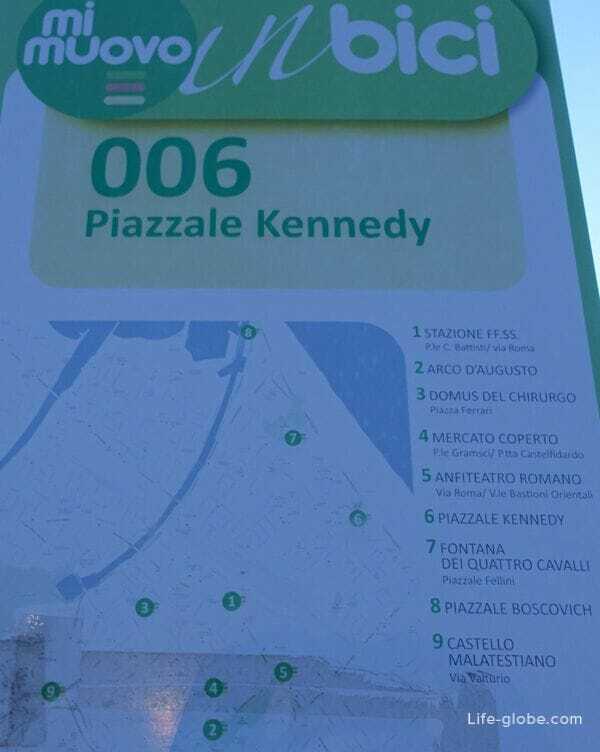 - Torre Pedrera, numbering from 56 to 76. 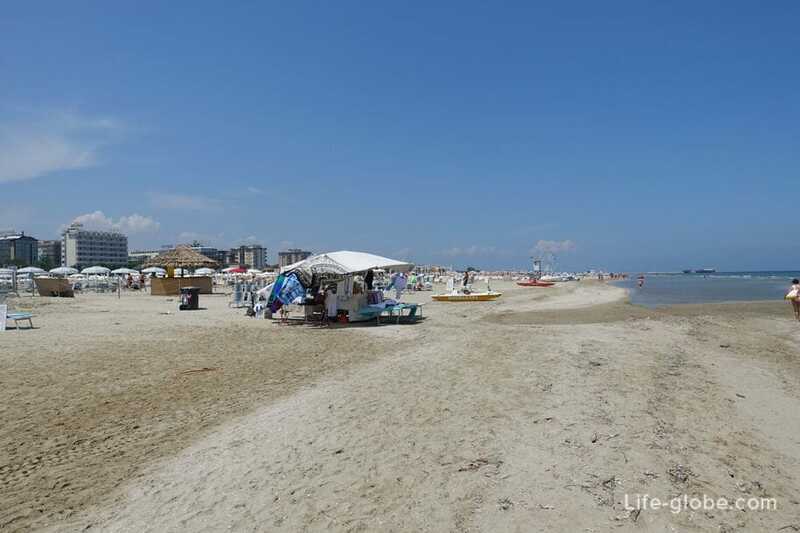 The division of beaches on a small area due to ease of orientation and, of course, direct income. 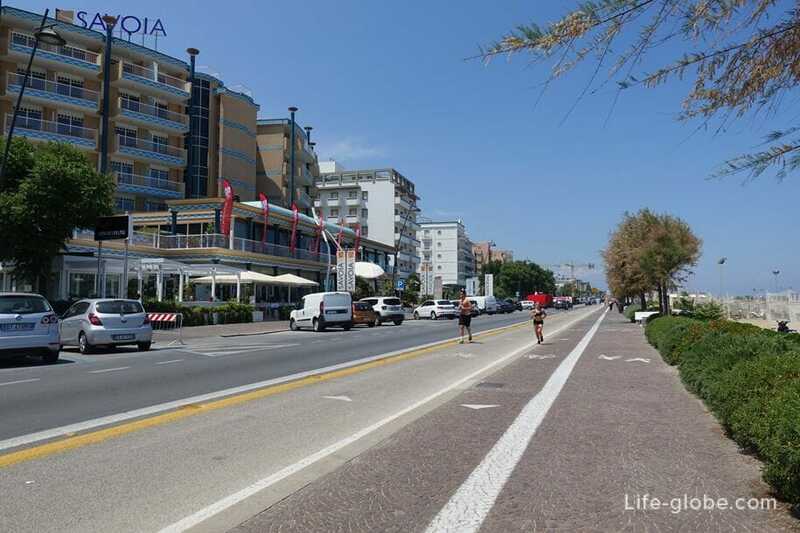 Each zone has all the necessary infrastructure and even more. 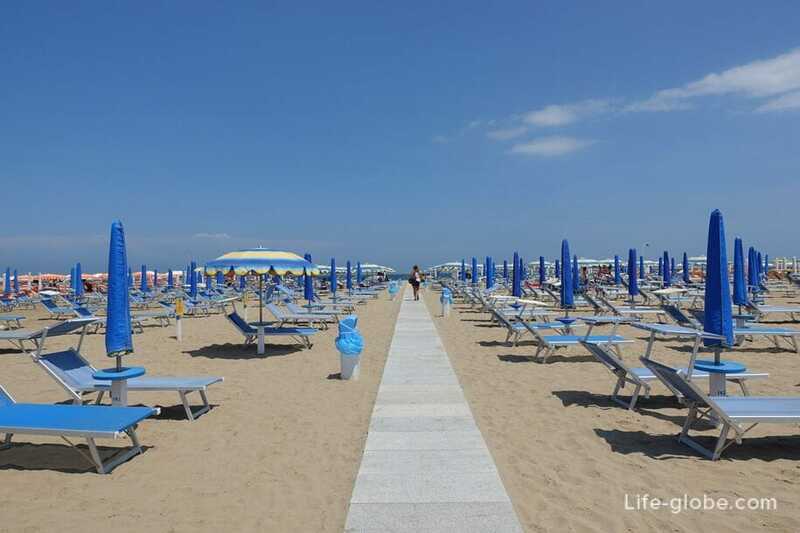 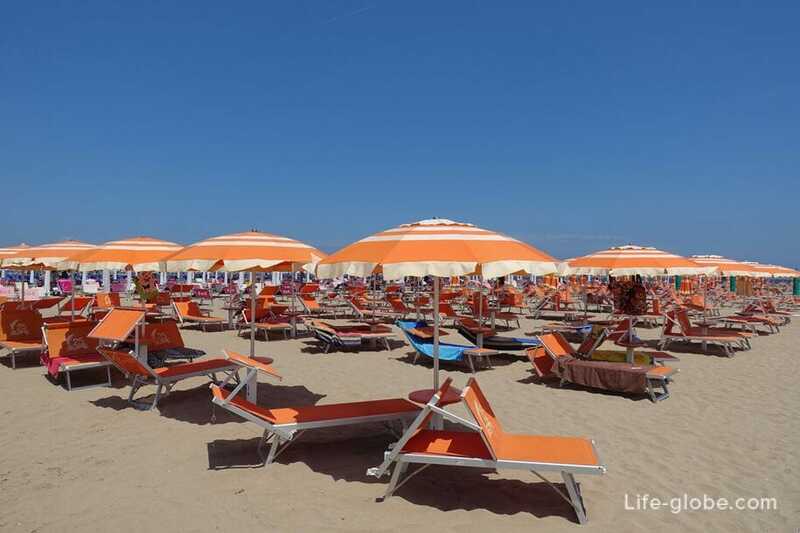 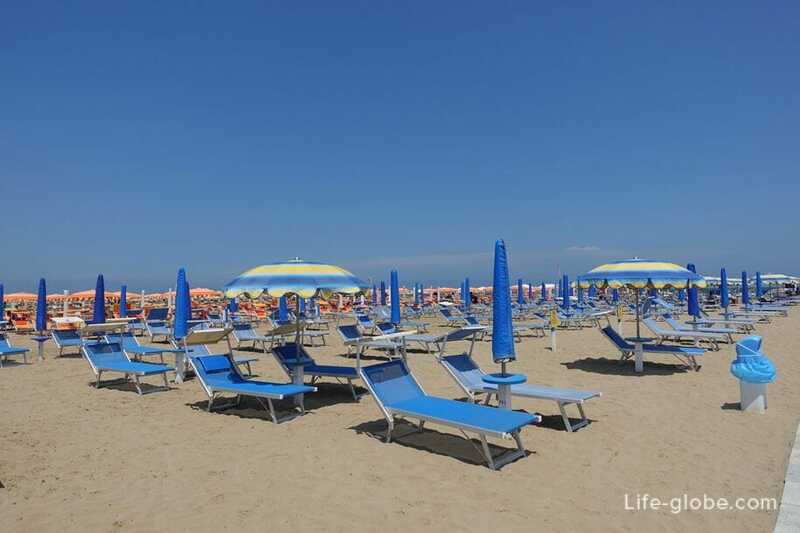 In every area of your color, sun umbrellas, so the beach is Rimini looks very rosy. 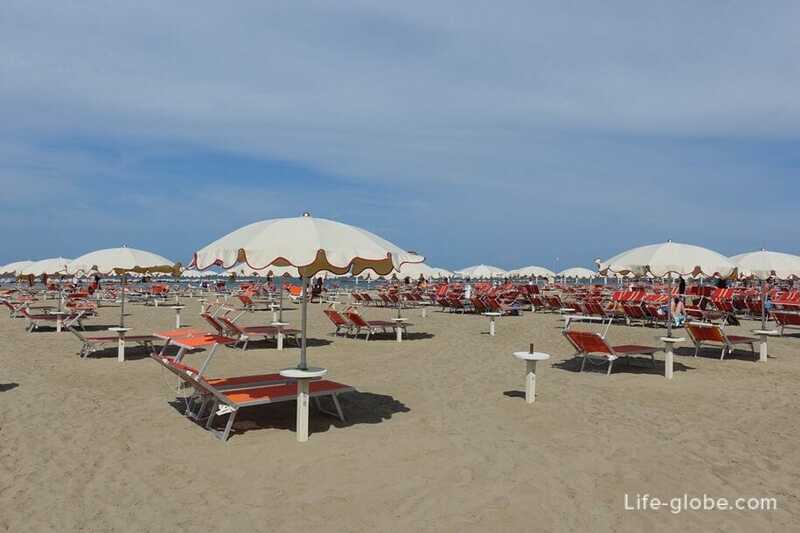 Sun loungers and parasols are arranged rather tightly and they occupy almost the entire beach strip, between the sun beds are equipped with decks for ease of movement. 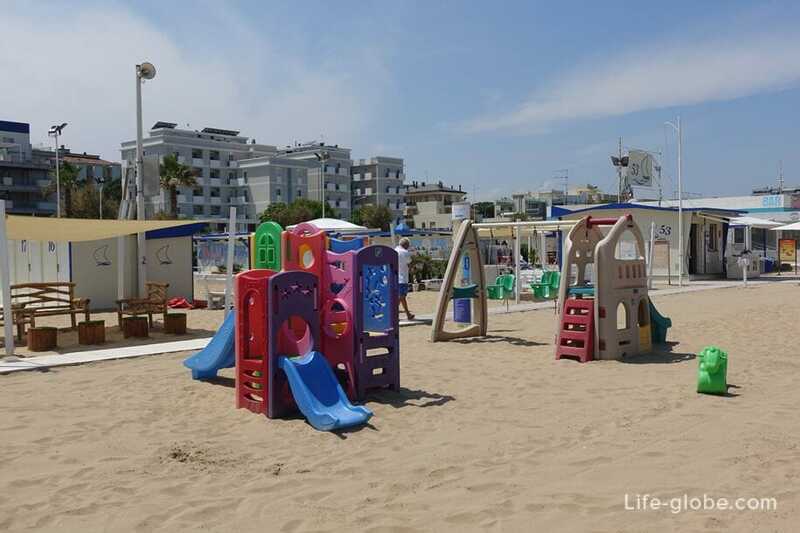 In addition, on the beaches, there are other facilities: toilets and showers, changing cabins and chambers for storage of small items, rescue towers and medical facilities, a small children's playgrounds. 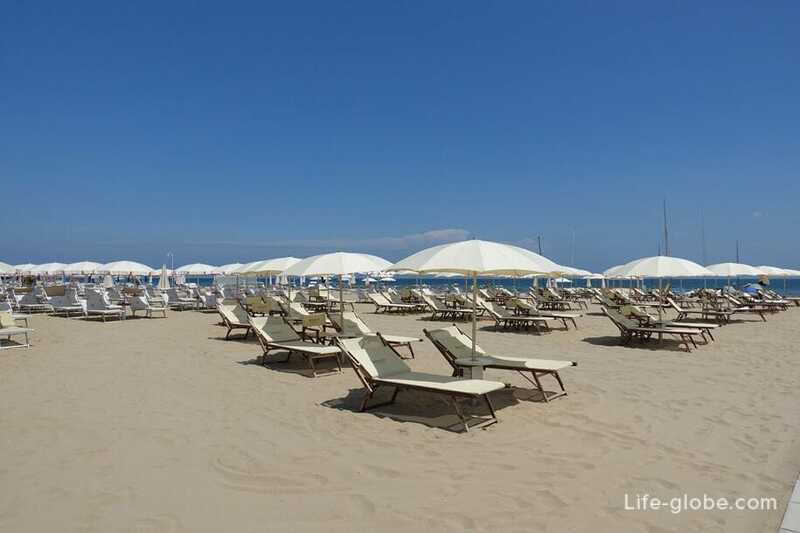 This is a minimal set of amenities that are present on all beaches. 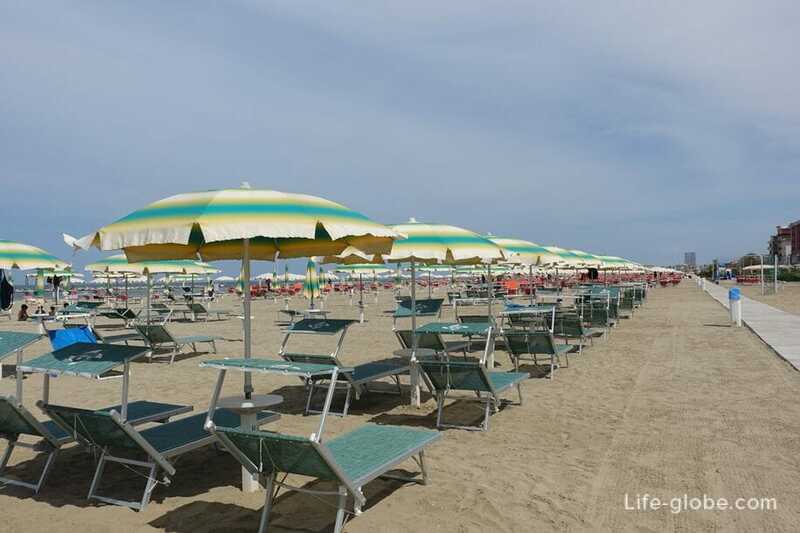 However, these services on the beaches are not limited to, the competition is high and in line with this, each beach is seeking to lure travelers. 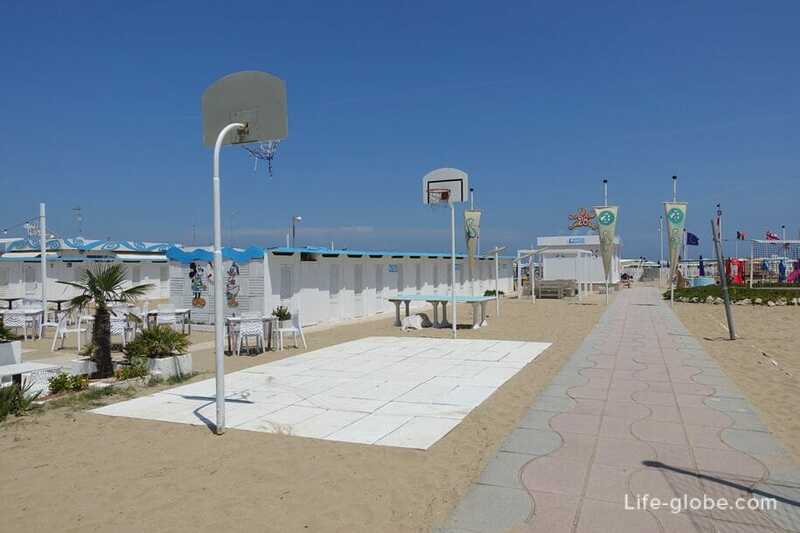 So the beaches can also be: a Playground for street ball, beach tennis and volleyball, children's pools, Jacuzzi, fitness equipment, table tennis, chess, checkers, recreation areas, areas for Pets, cafes and beach bars, entertainment, Newspapers and books for those who want to read, etc. 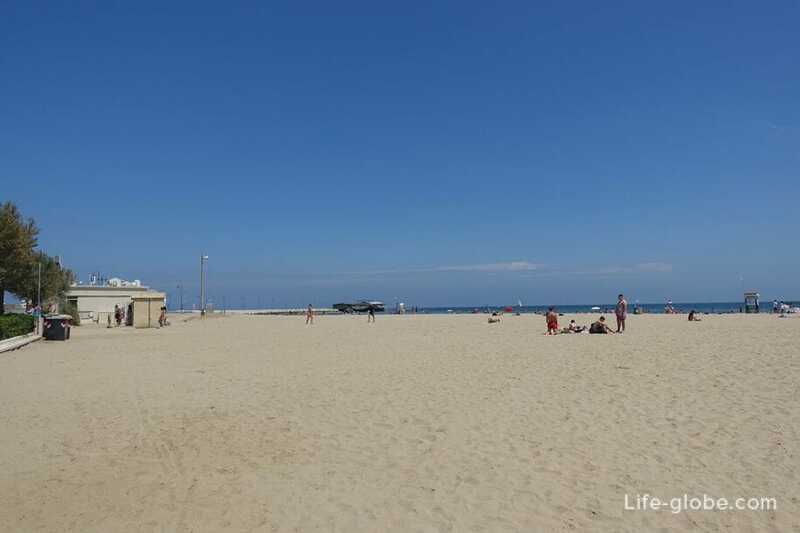 The most Central beaches catches free Wi-Fi. 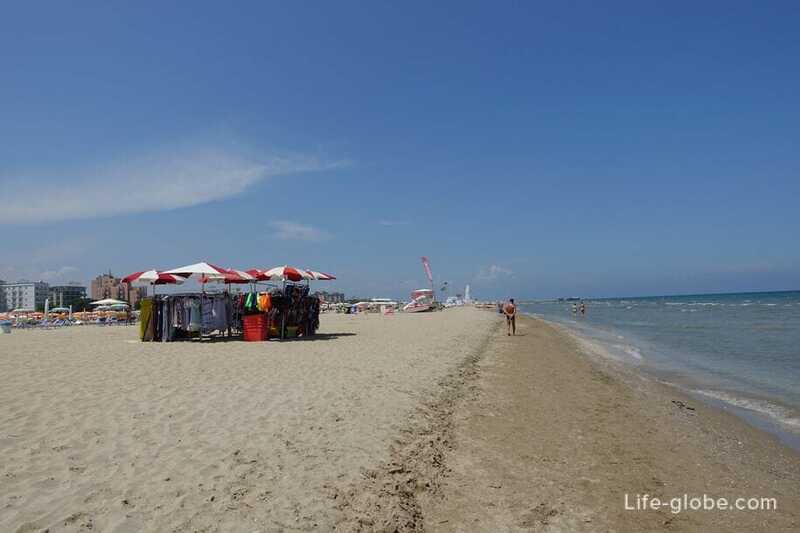 Choose the beach should be based on your own preferences and the style of holidays. 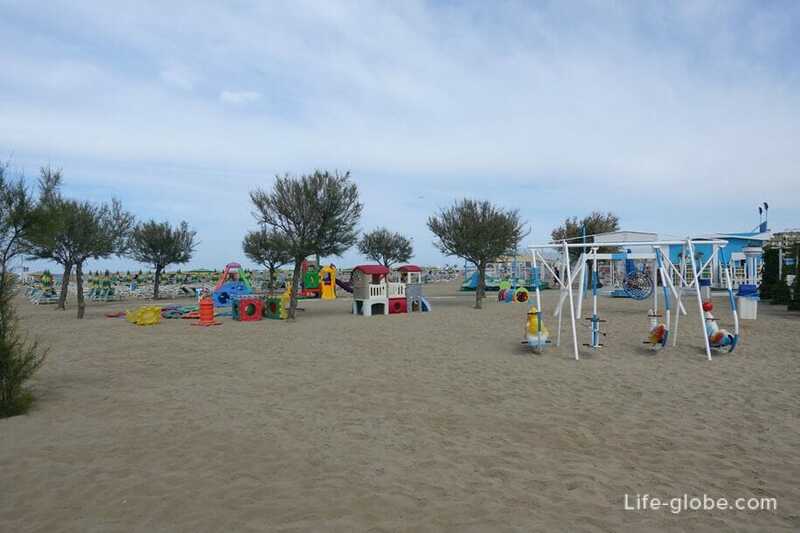 There are the beaches more equipped for children and families, there will be more children's play areas and animations, as well as to attend children's toilets and showers. 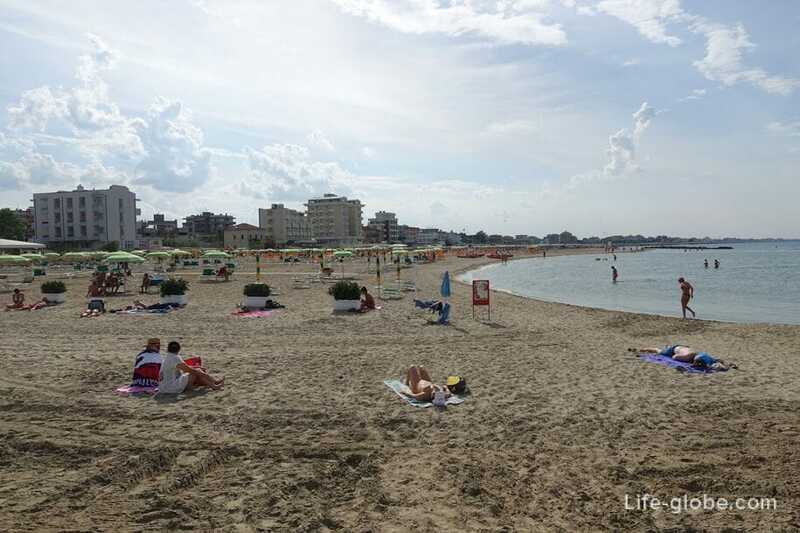 On other beaches, in more sports, more places to practice different active games. 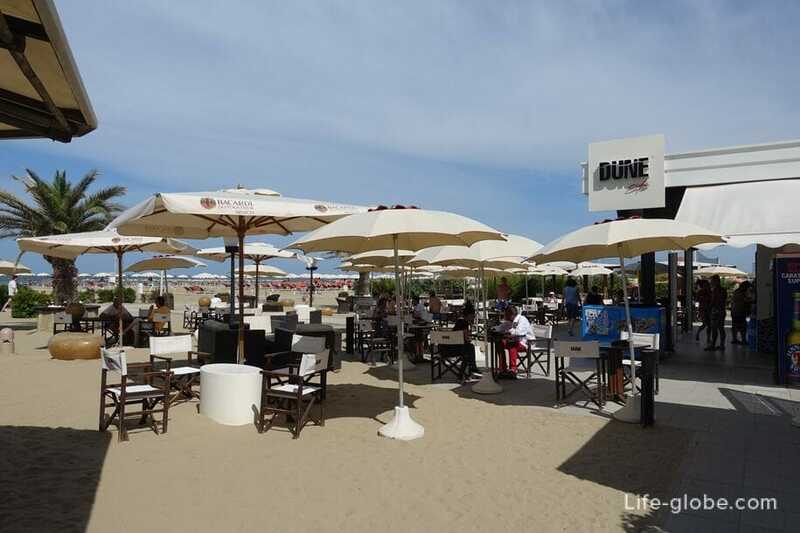 On the third not only has a bar or cafe, but also bars, located directly near the coastline. 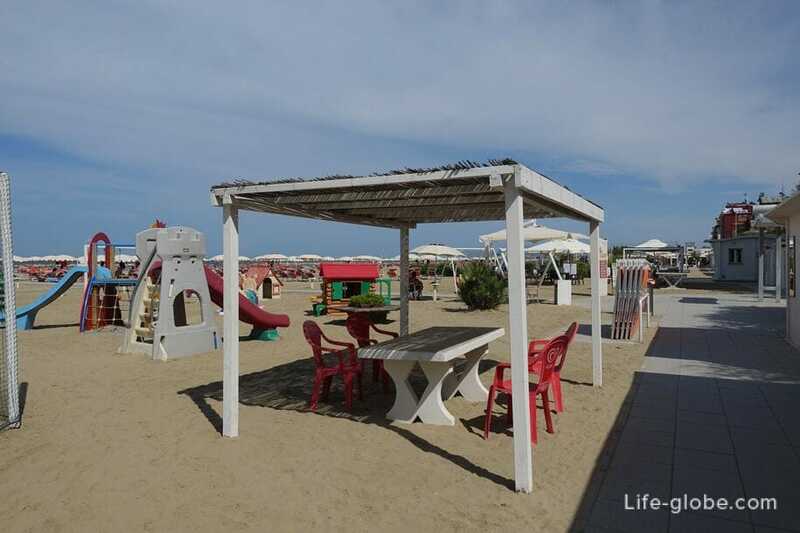 The fourth - chess, checkers and Newspapers, which indicates the priority at this beach recreation for people of more Mature travelers. 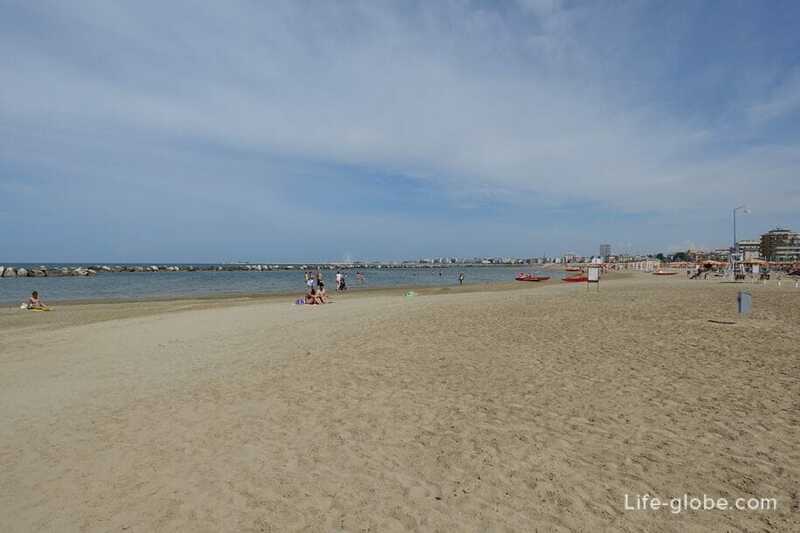 Despite this the essence of the beaches remains the same. 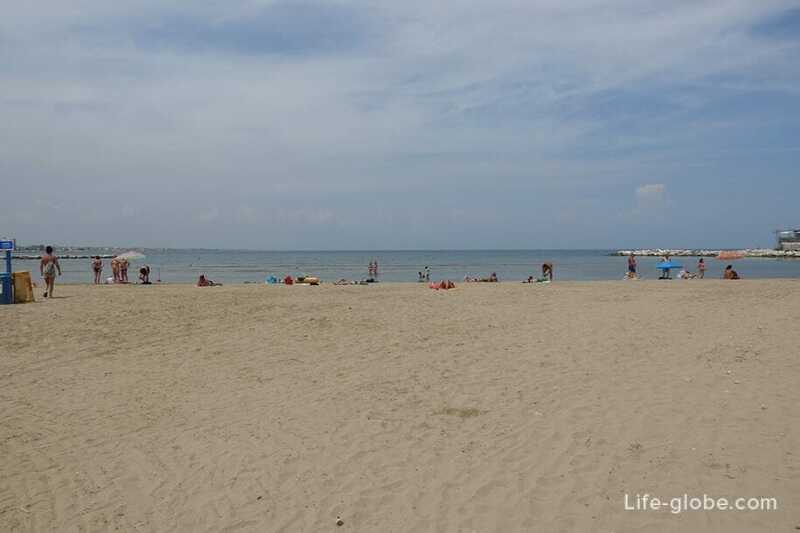 The only thing we've found is more significant is that there are beaches more free from all the above additional entertainment, which is more comfortable to rest, and there are those where every inch of something so cluttered, which makes the beach less comfortable to use for its intended purpose. 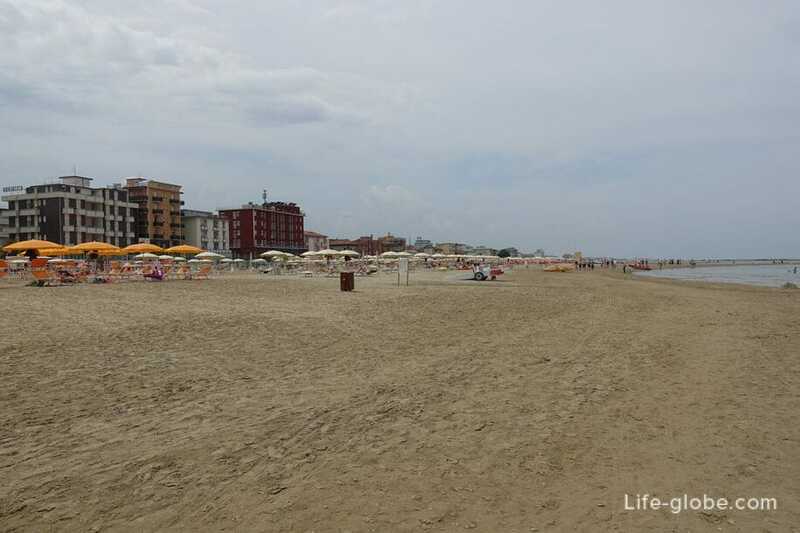 All the beaches of Rimini are wide, flat and sandy. 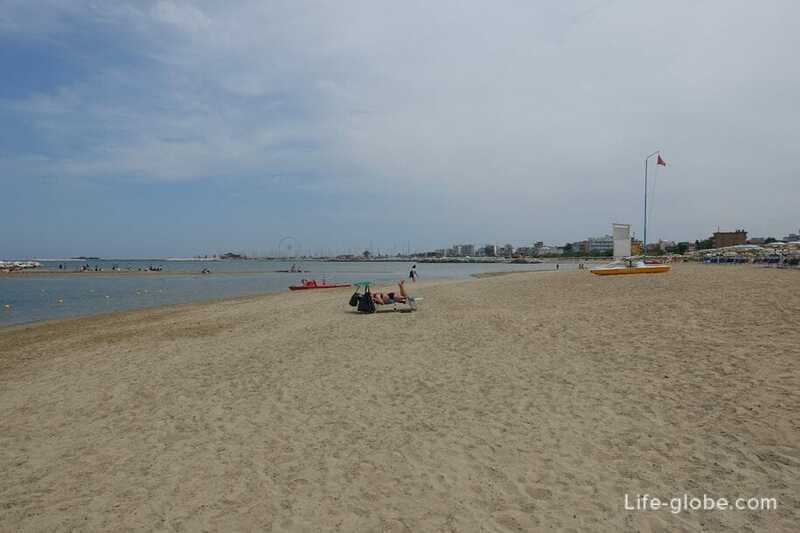 The beaches are regularly cleaned, sand dub. 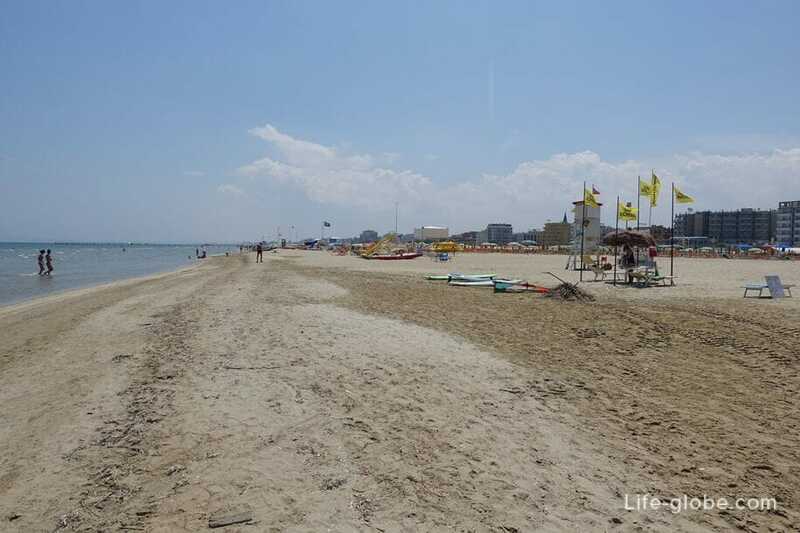 However, the cleanliness of the beaches depends on the beach area. 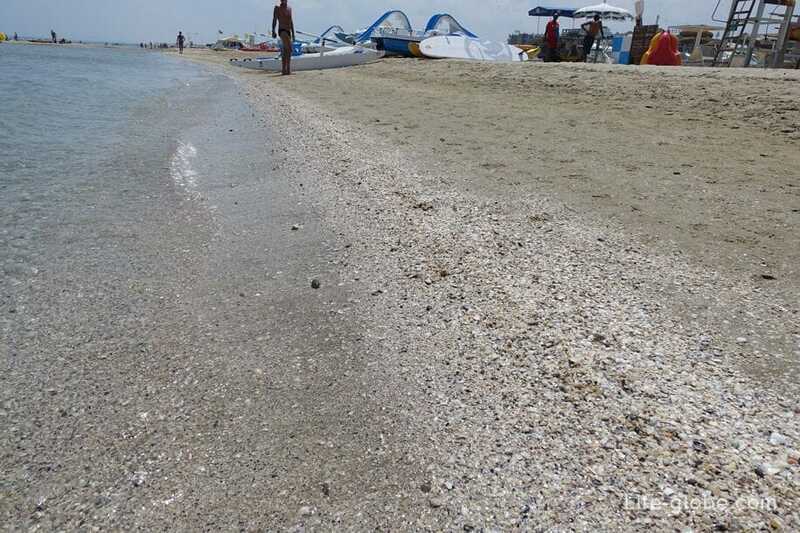 There are beaches cleaner, and there are those containing small shells near the sea and the debris in the form of cigarette butts. 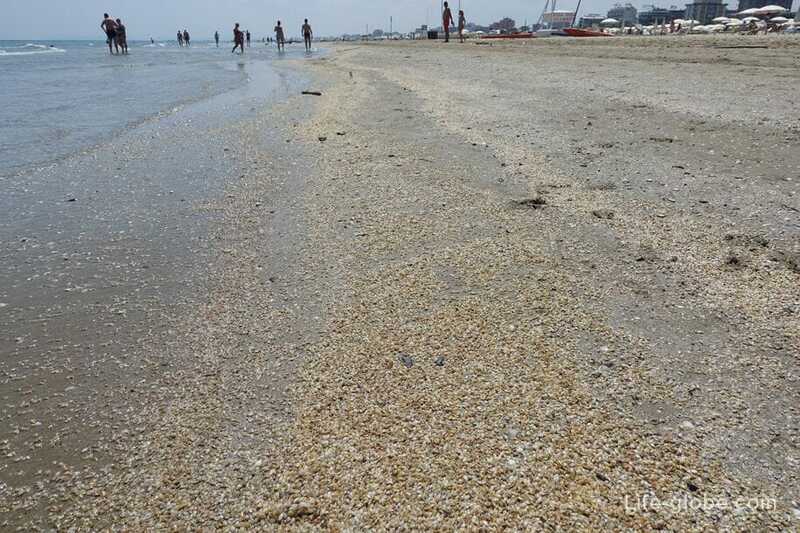 On some beaches, near the sea, there is a smell coming from small shells, put on shore. 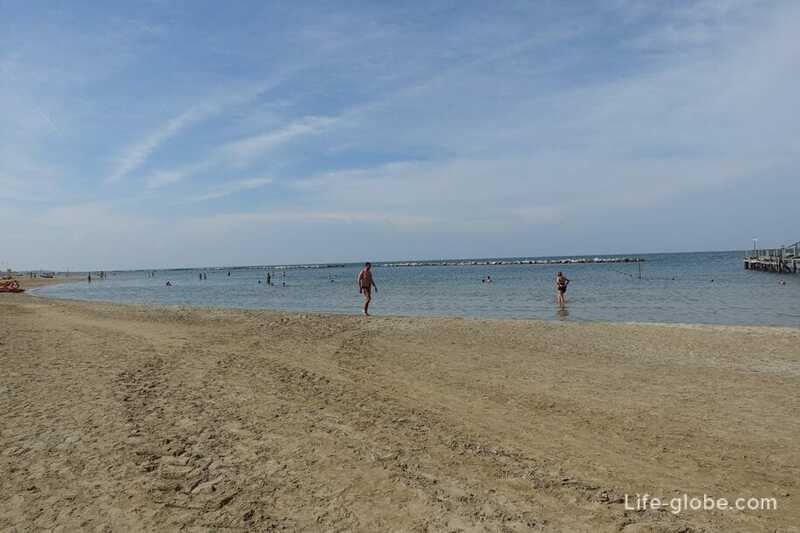 Cleanliness, softness of the sand and the sunset in the sea, we liked the Southern beaches No. 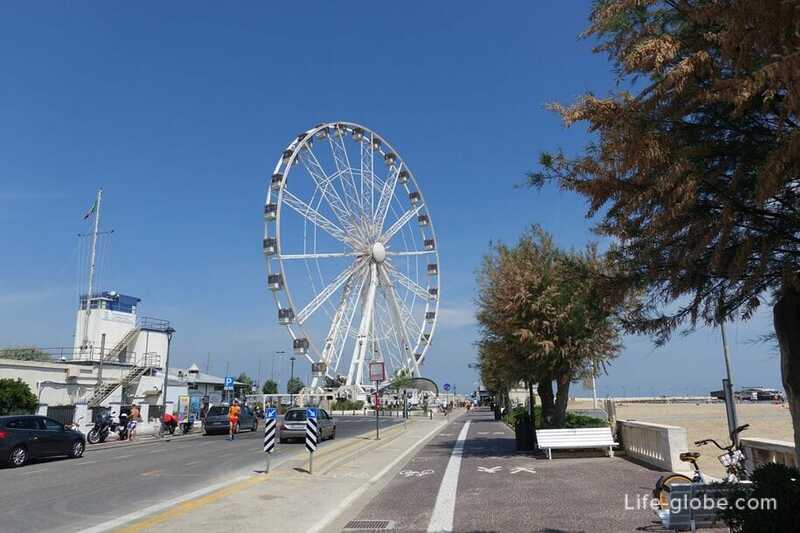 54 and 55. 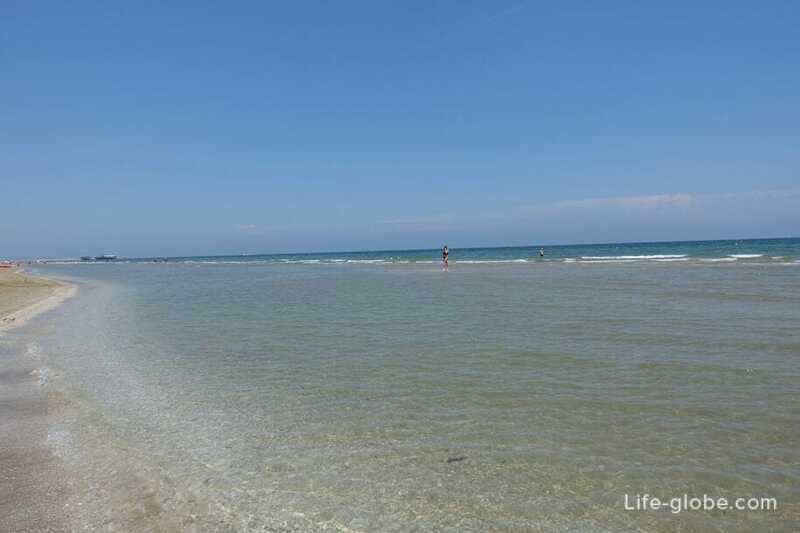 Sea water is clean and clear, sandy bottom, on some beaches at the bottom of the shell. 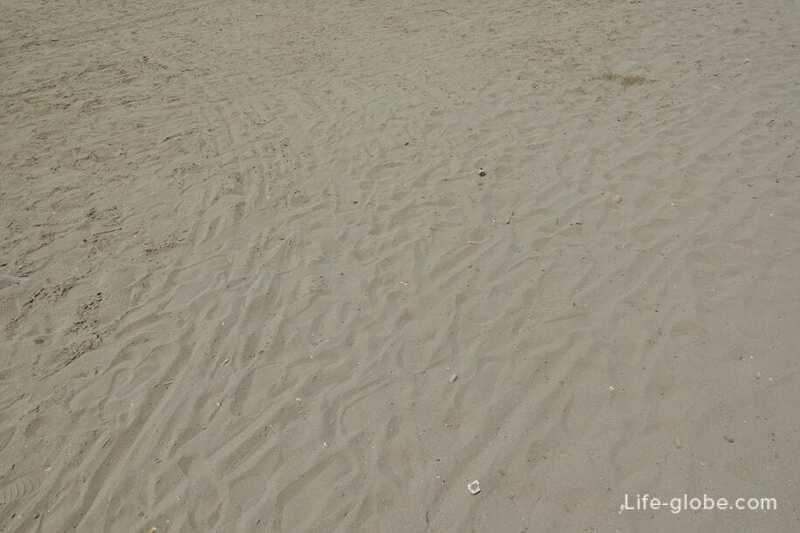 Sunset in shallow sea depth is gradual. 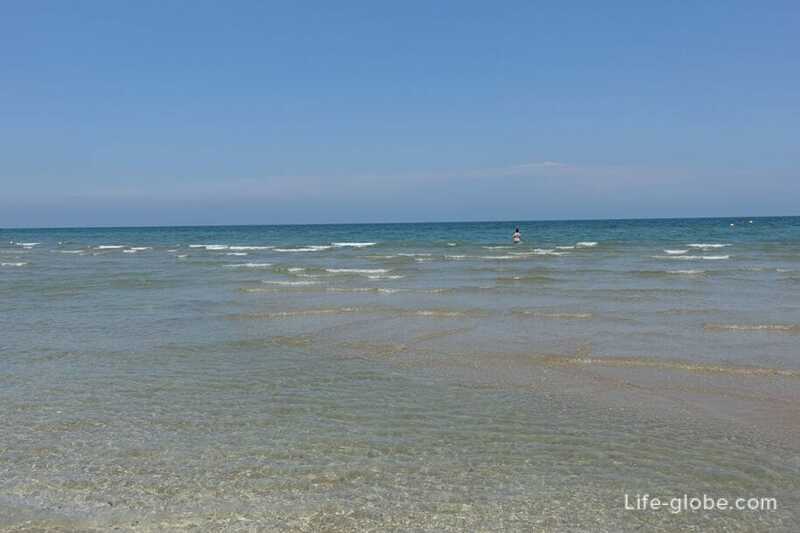 In early June the sea water was warm enough. 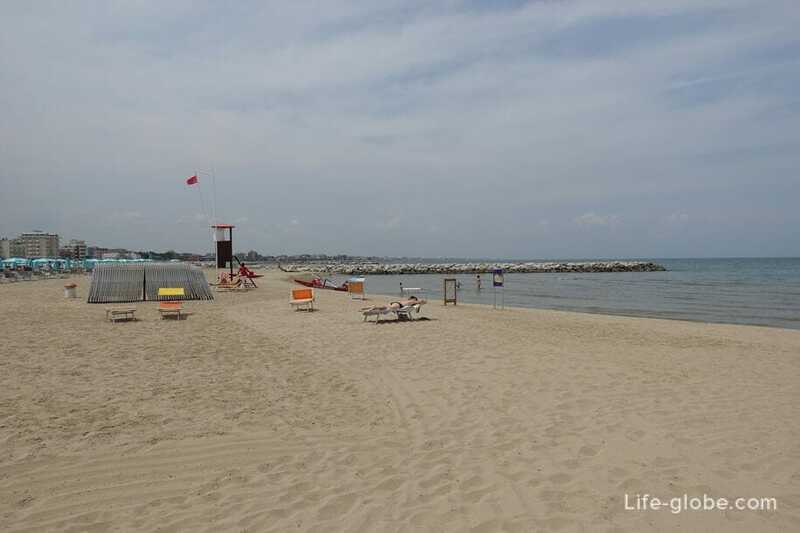 By themselves the beaches of Rimini free. 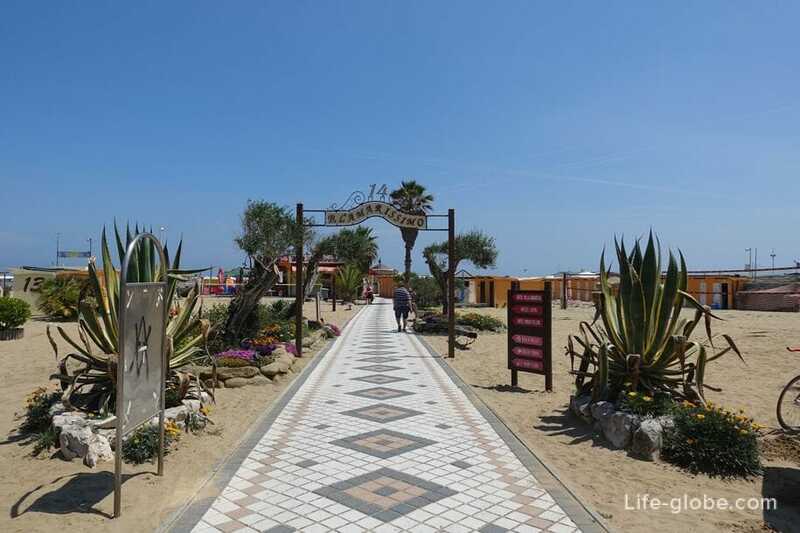 That is, the entrance to the beach, no money will not take. 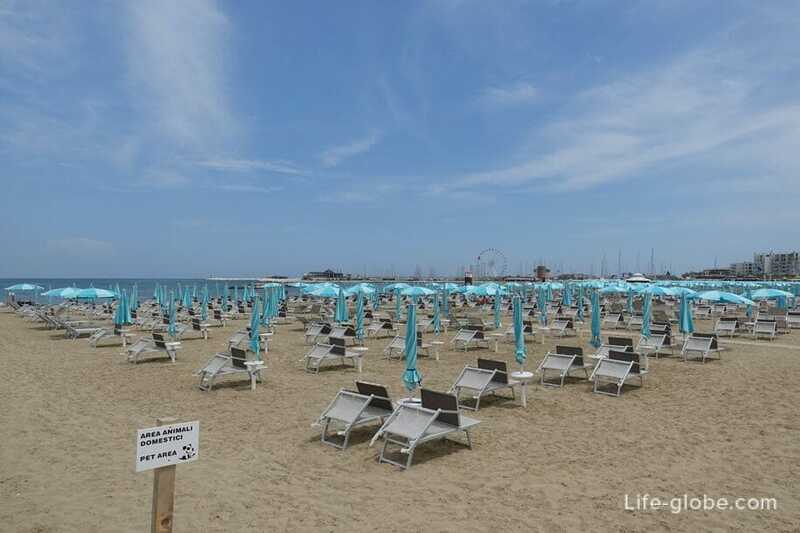 But for the use of beach chairs and umbrellas will have to pay. 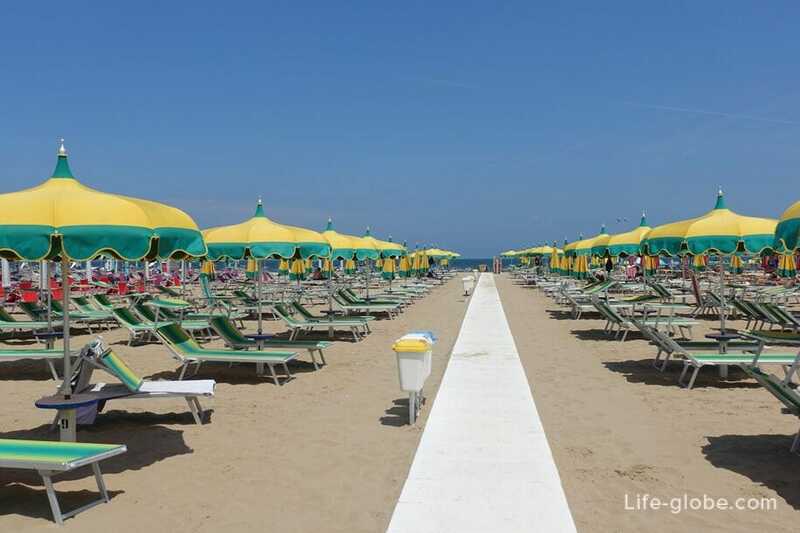 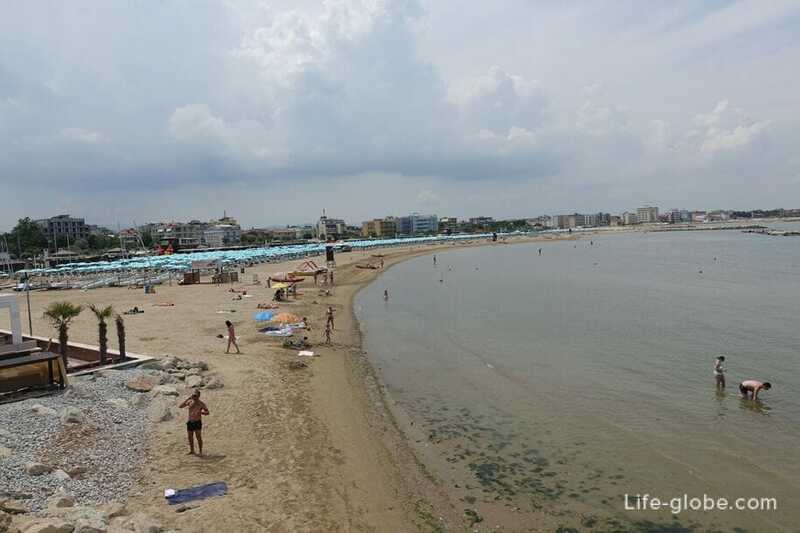 Although the coastline of Rimini and wide, but most of it is occupied by sunbeds and other amenities, so place for free will is that at the edge of the water. 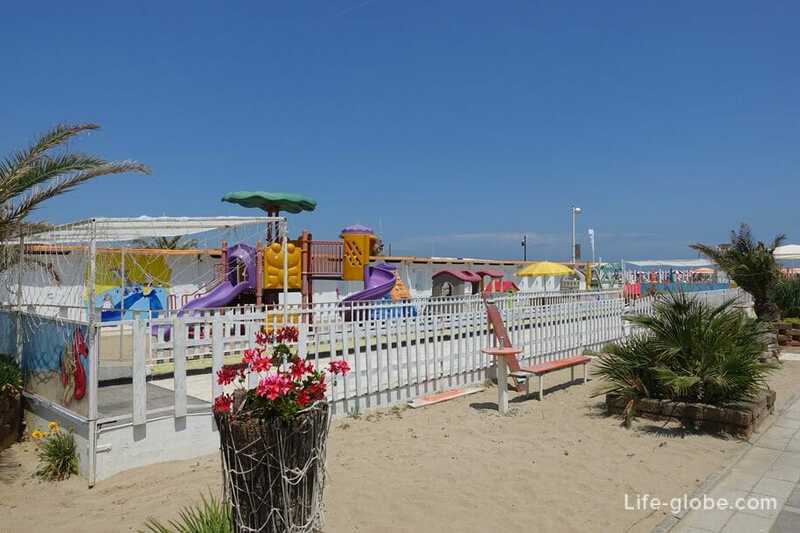 In the rental of sun loungers includes use of toilets, showers, changing rooms, and most of the other amenities and entertainment. 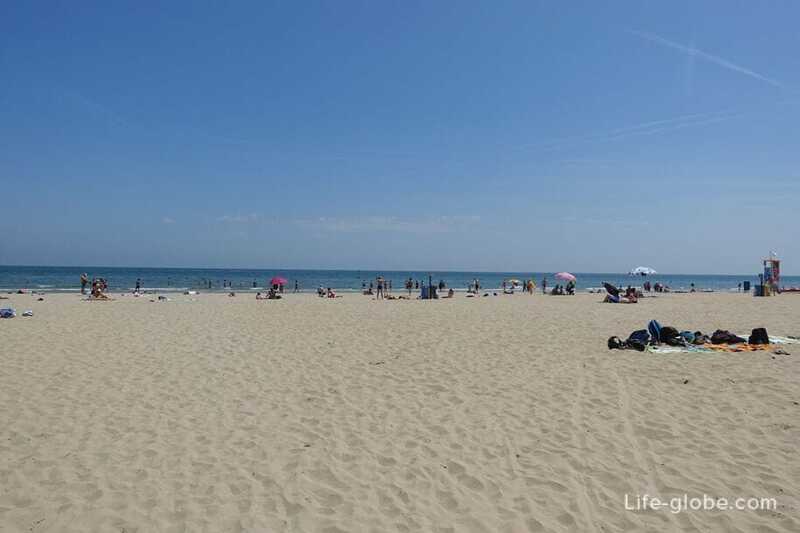 The cost can vary from beach to beach, but, on average, about the same. 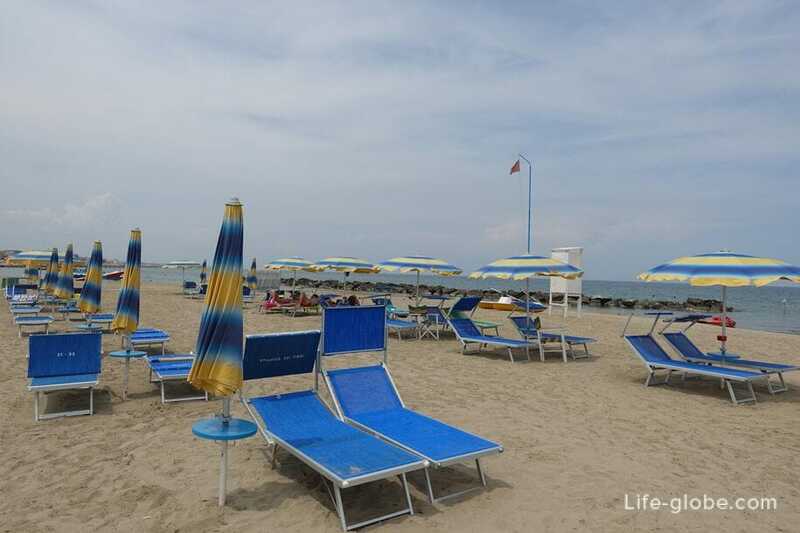 The cost of chairs depend on the distance from the sea - the closer to the sea, the more expensive. 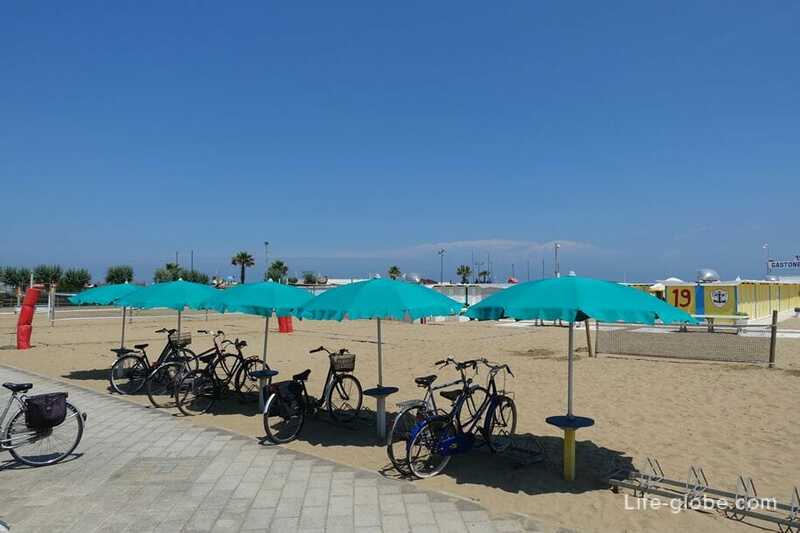 You can pay per day or purchase a subscription for a week, month, etc Average cost for two sunbeds and umbrella from the sun - 16-20 Euros per day, week - 95-120 Euros. 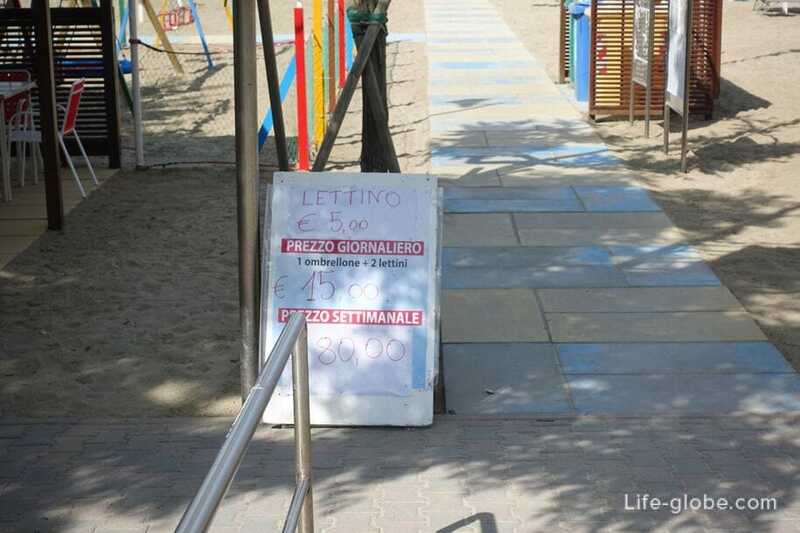 Almost near the sea you can rent chairs without umbrellas for 3-7 Euros for a sunbed. 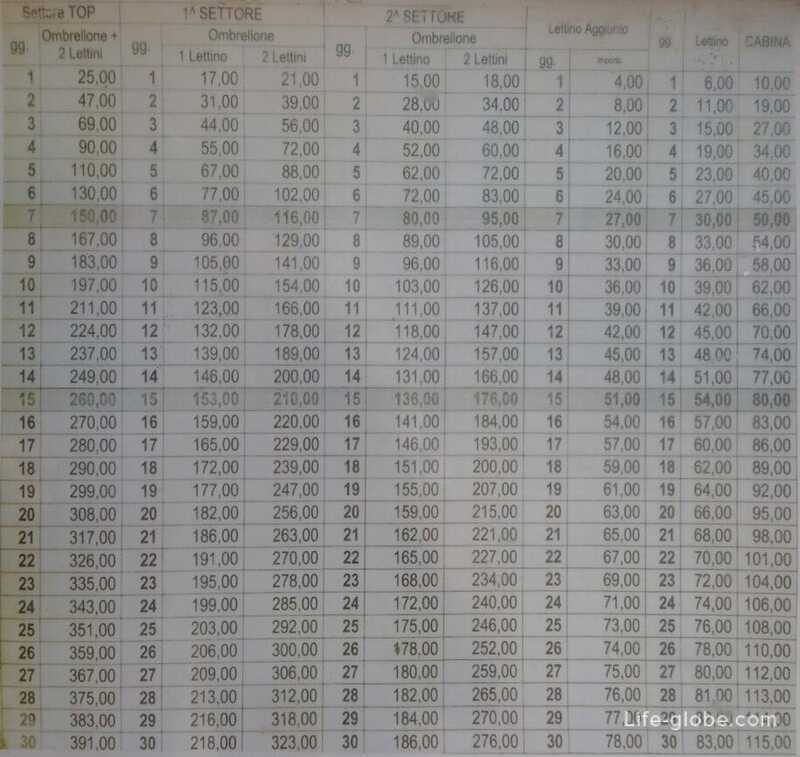 - between 139 and 140 zones. 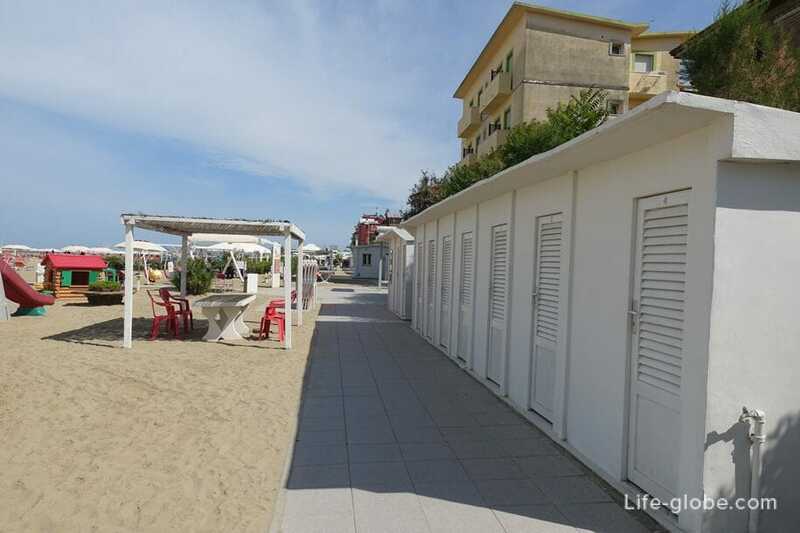 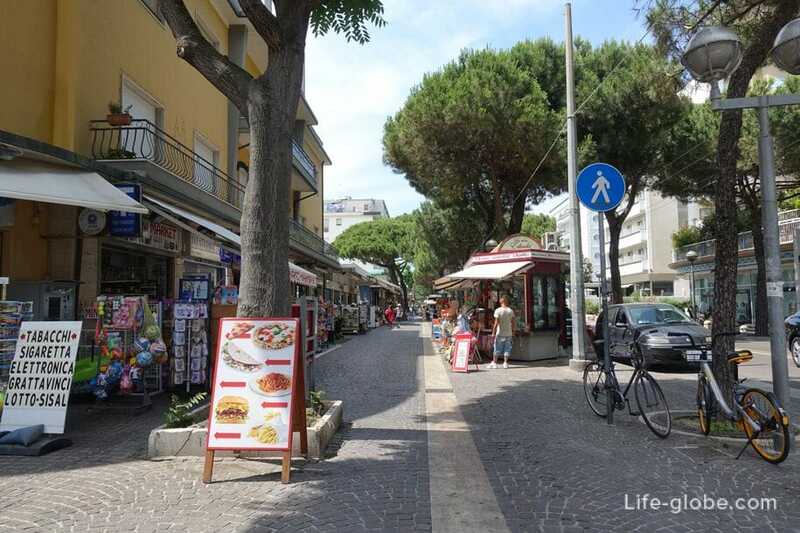 - over 150 area on the border with Riccione. 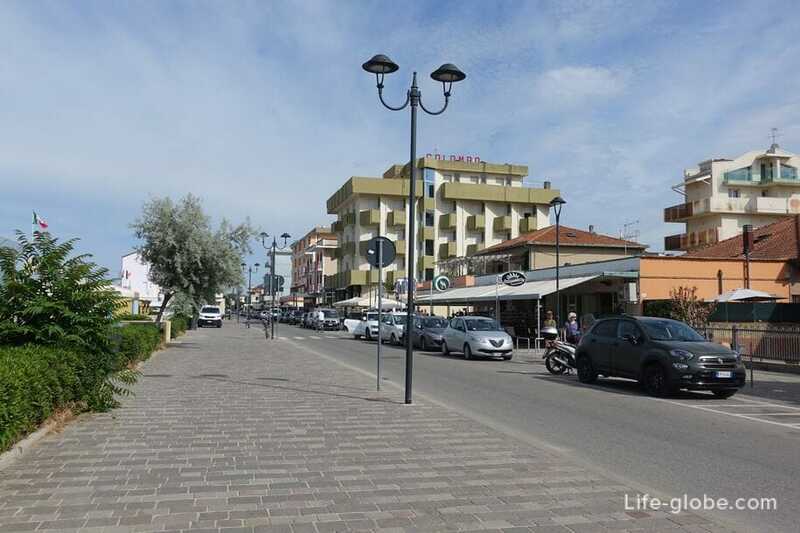 - 76 area on the border with Bellaria. 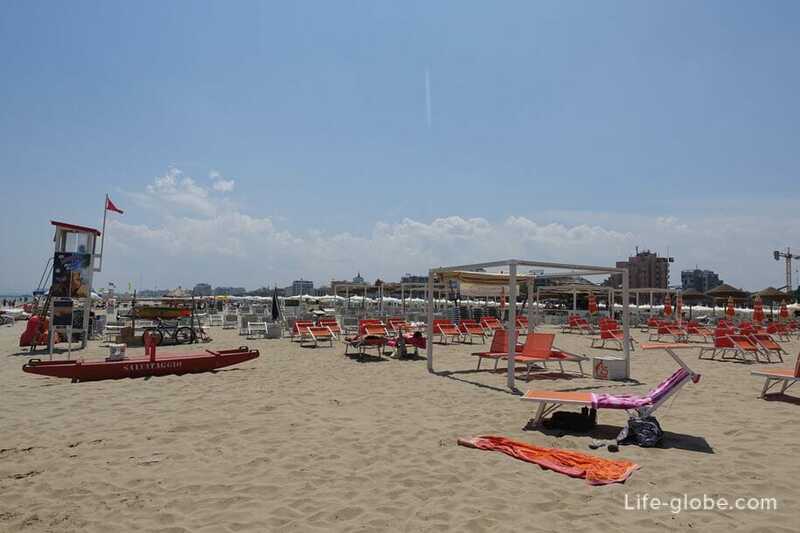 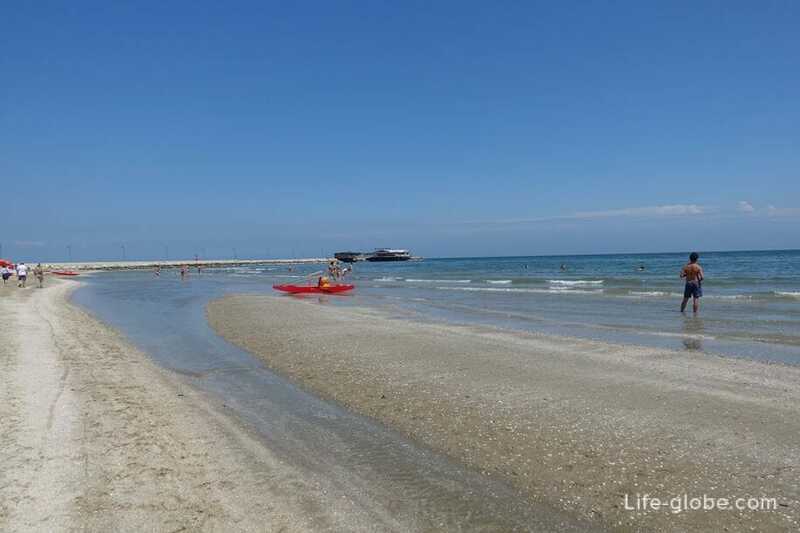 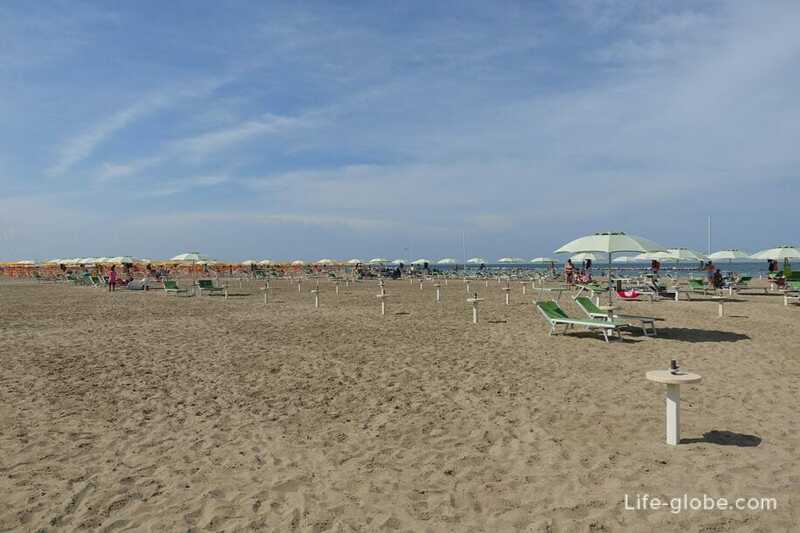 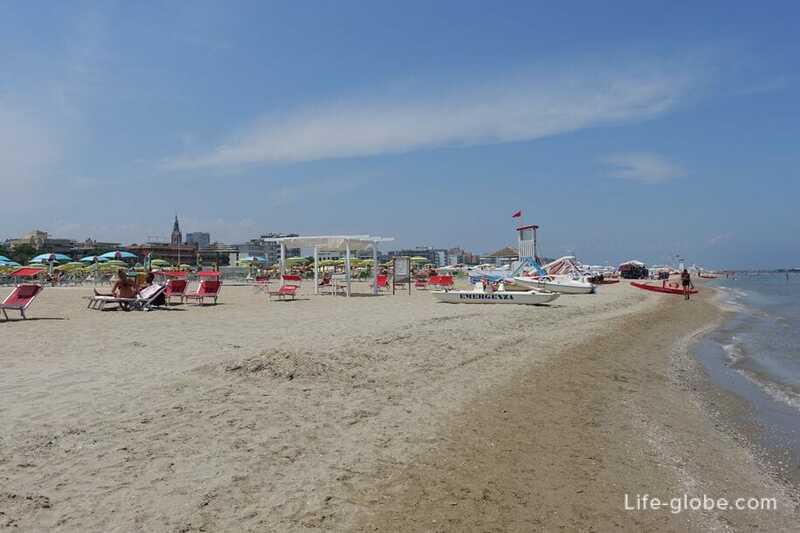 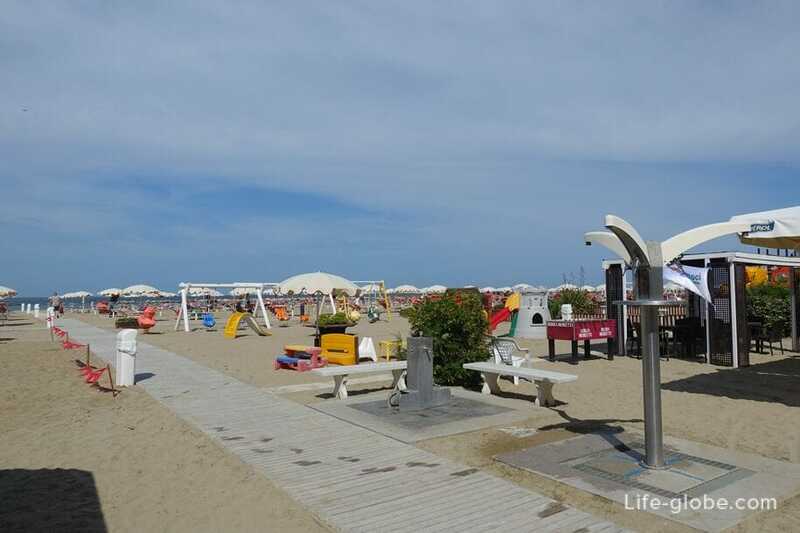 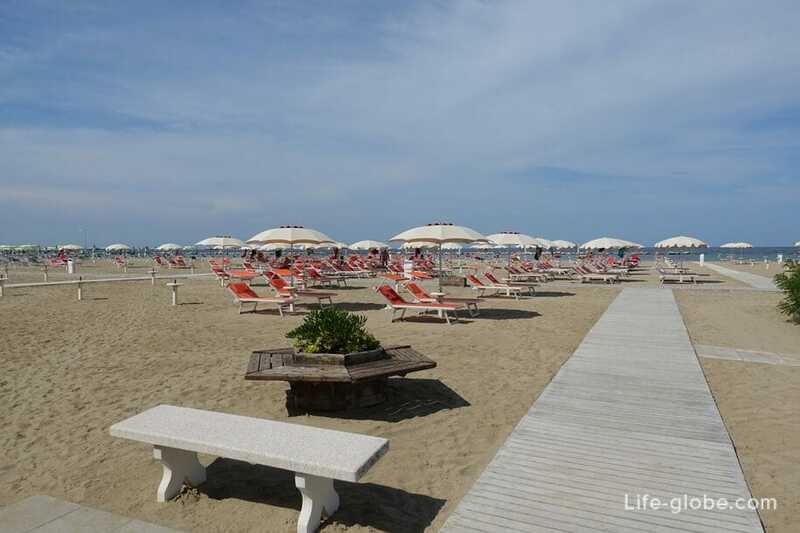 What the beaches of Rimini is better - North or South? 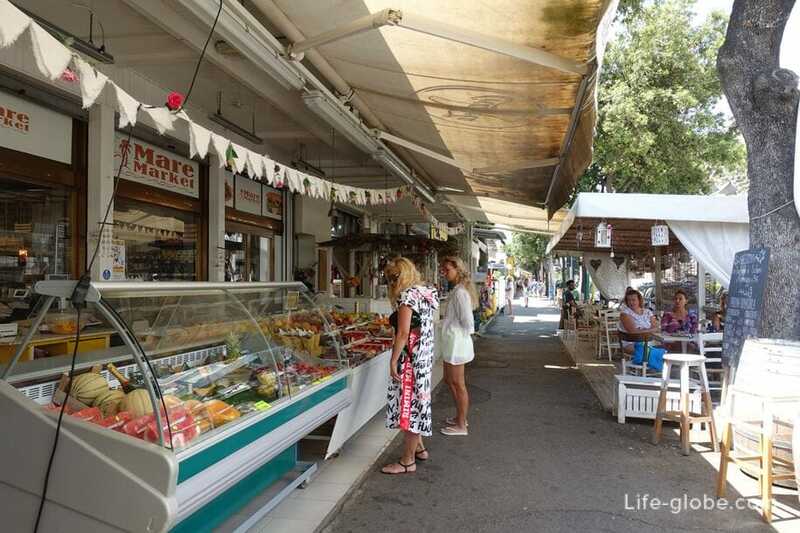 Hard to say, here on taste and color. 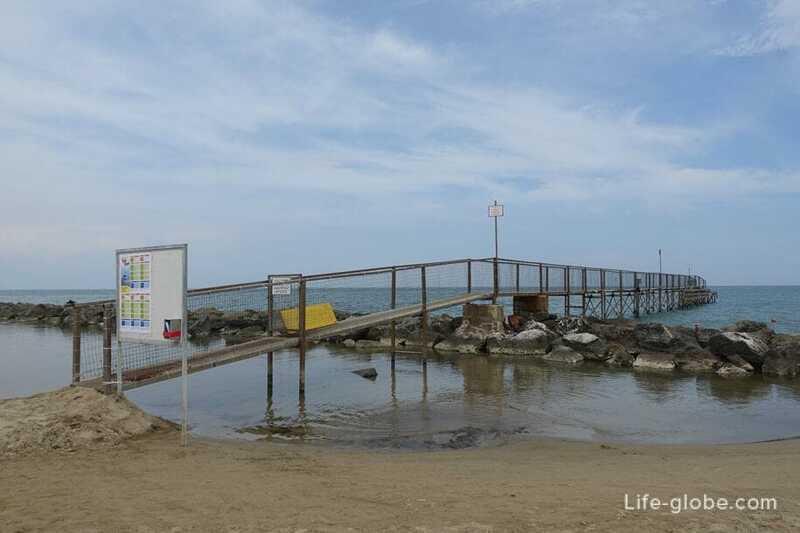 The only difference is that that in the sea's Northern beaches there are stone breakwaters, so the two meet crabs, and if you stand in the water, they can pinch the finger, not painful, but unpleasant. 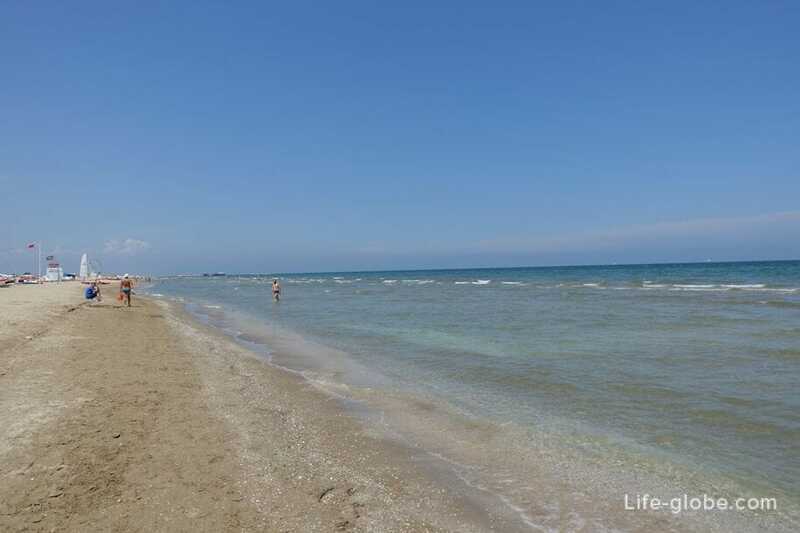 We tweaked a couple of times, then swim in this area, the desire has disappeared. 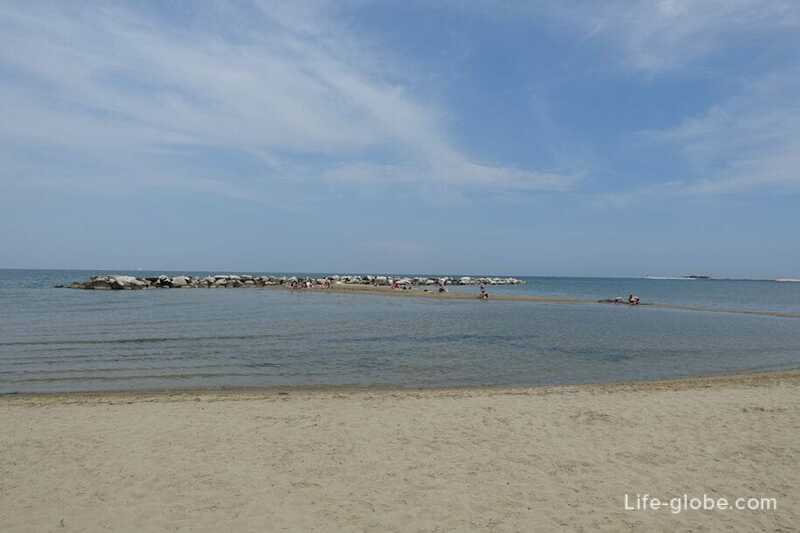 At the southern beaches groynes no, that would make bathing more comfortable. 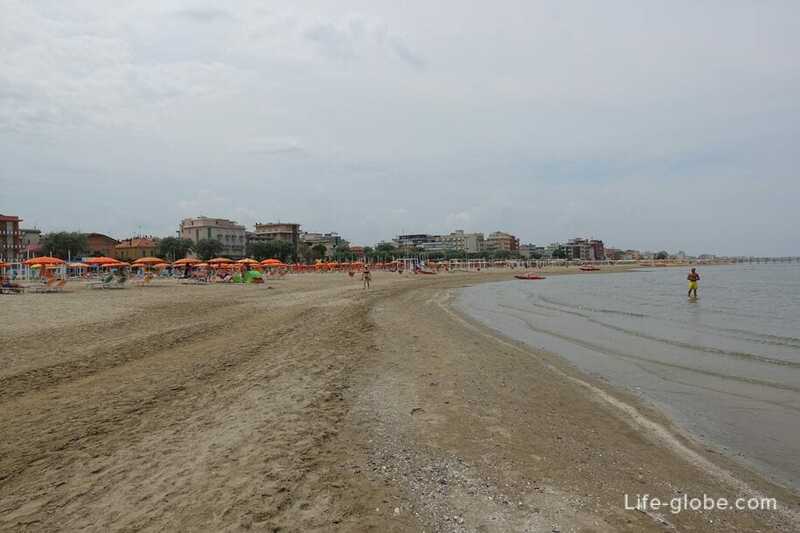 The beaches in Rimini we found it dirty and crowded. 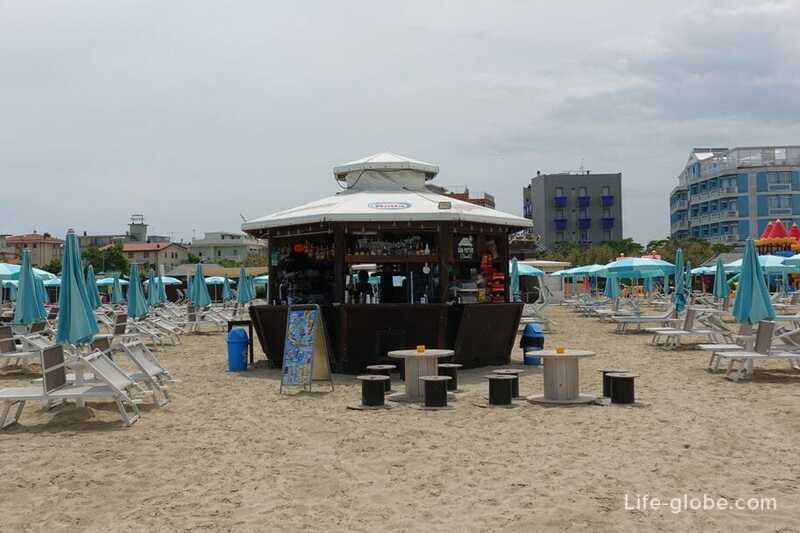 Then we went to South beach № 55. 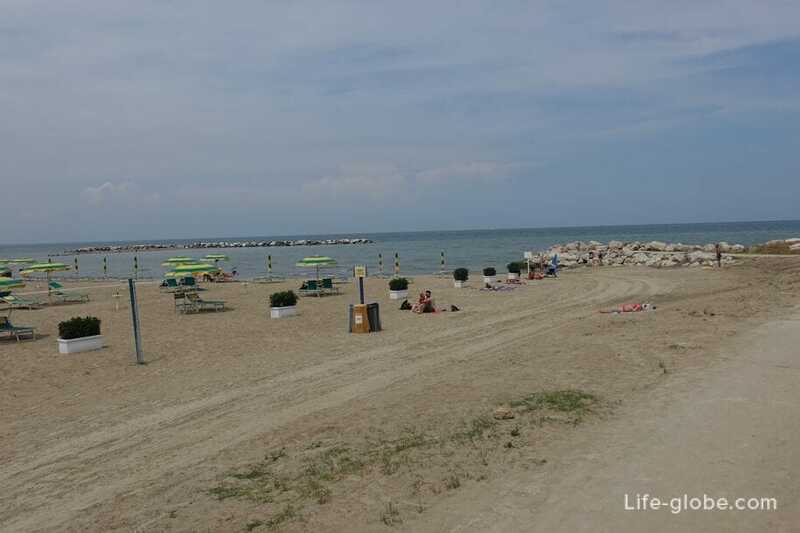 This beach is located near the centre and one of the cleanest. 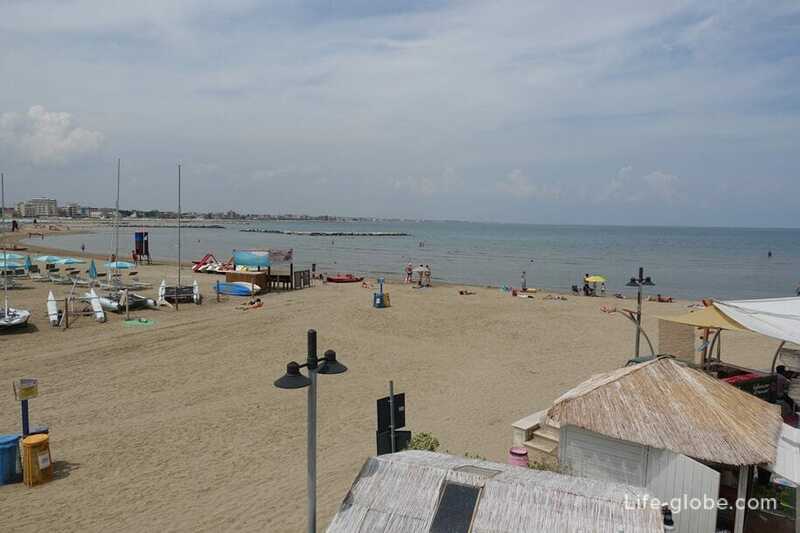 San Giuliano - the first North beach, from the southern beaches is the port and the channel, and from the rest of the North - the river Fiume Marecchina, so the beach turns out cut off from other beaches. 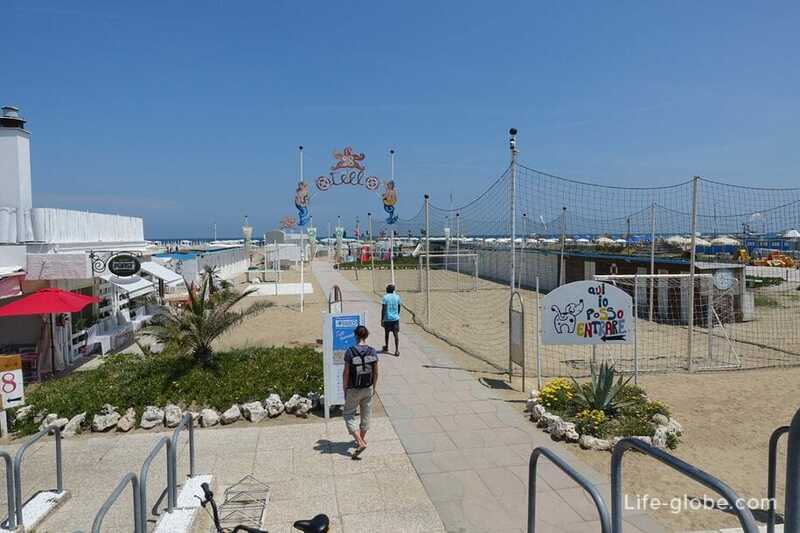 To reach the beach on bridges, which will have North and South coast of the parties to Rimini to go a little deeper into the city. 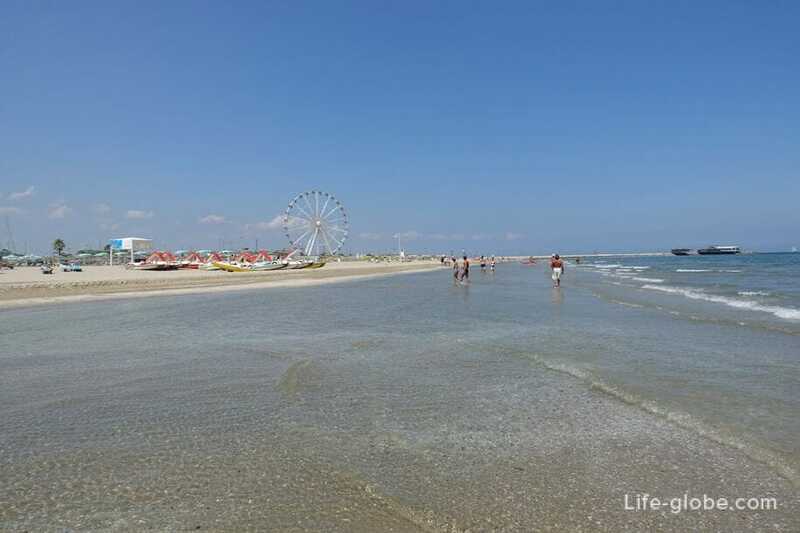 They say that this beach is one of the busiest, but it was one of the most desolate. 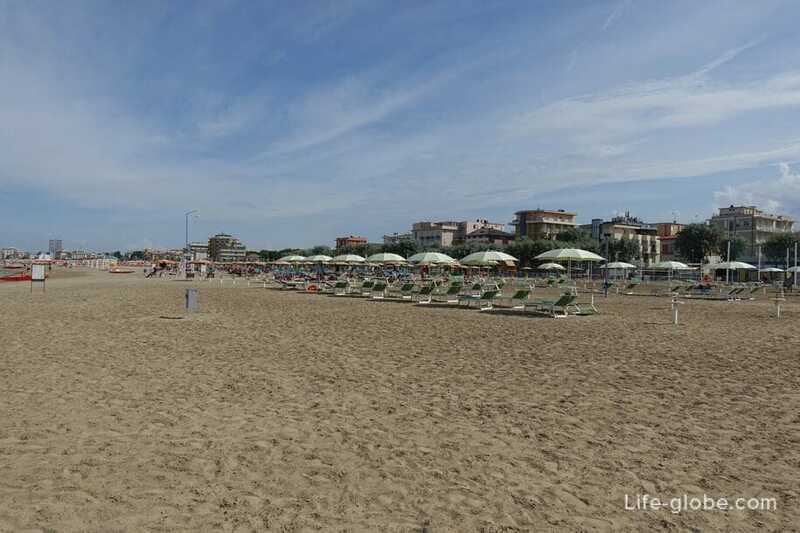 The impact location. 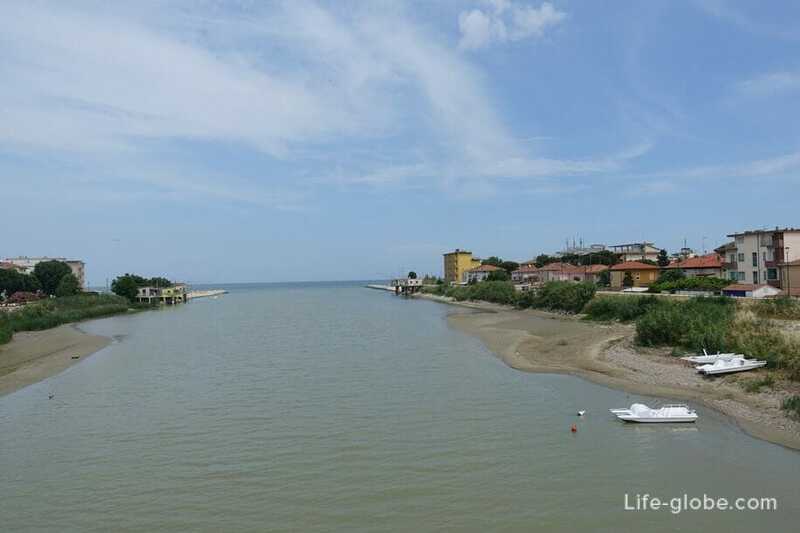 The river originate 4 North beach stretching to the Northern border of Rimini single beach. 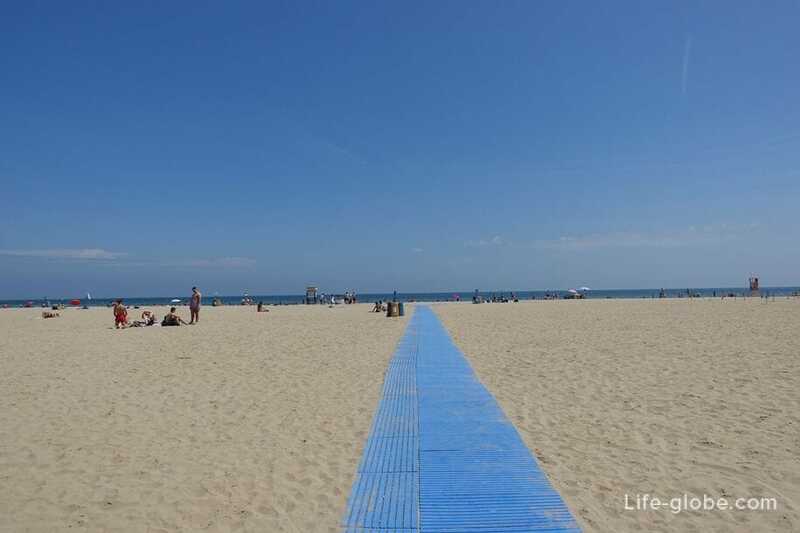 Above the line the greater part of the Northern beaches are hotels and apartments with direct access to the beaches. 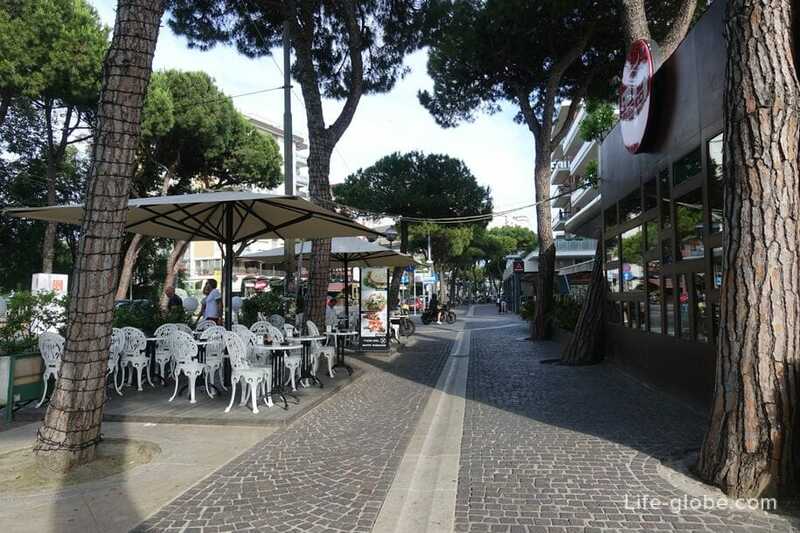 Behind the hotels is passing by the road, on both sides of which there are a few cafes and bars. 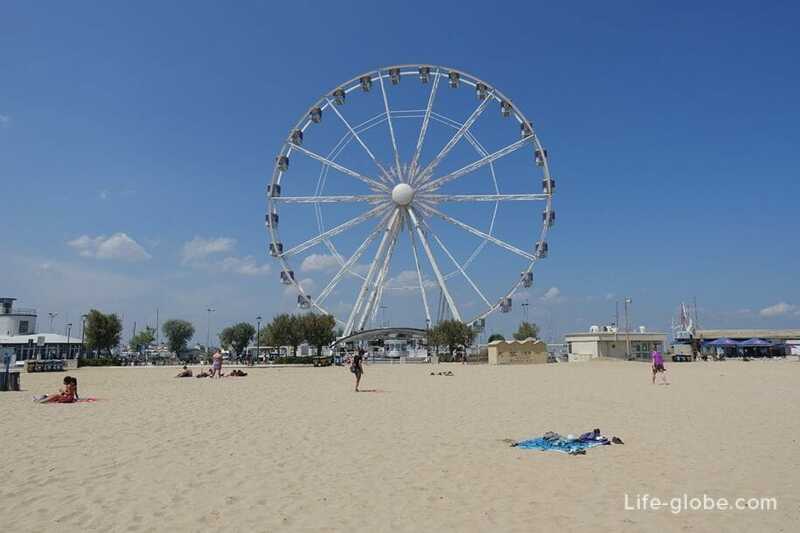 Above the beach line is passing by the road. 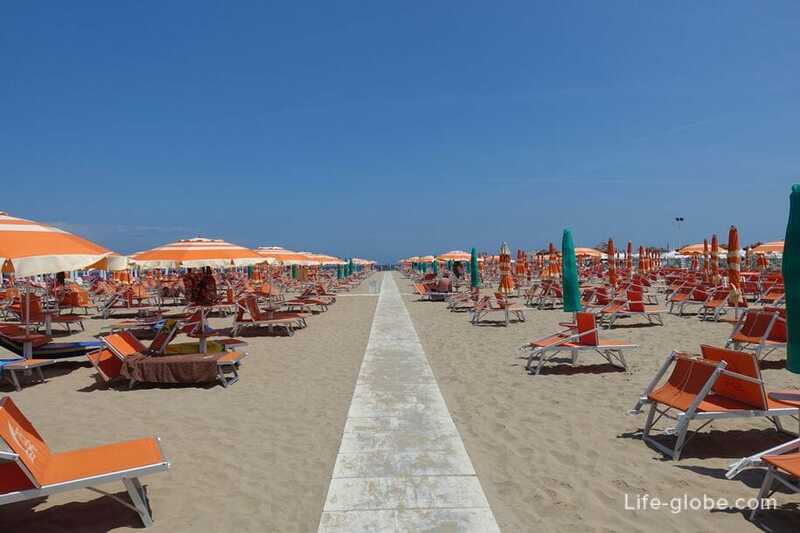 Near the greater part of the southern beaches there are no hotels located directly on the beach, to enter the beach you need to cross the road. 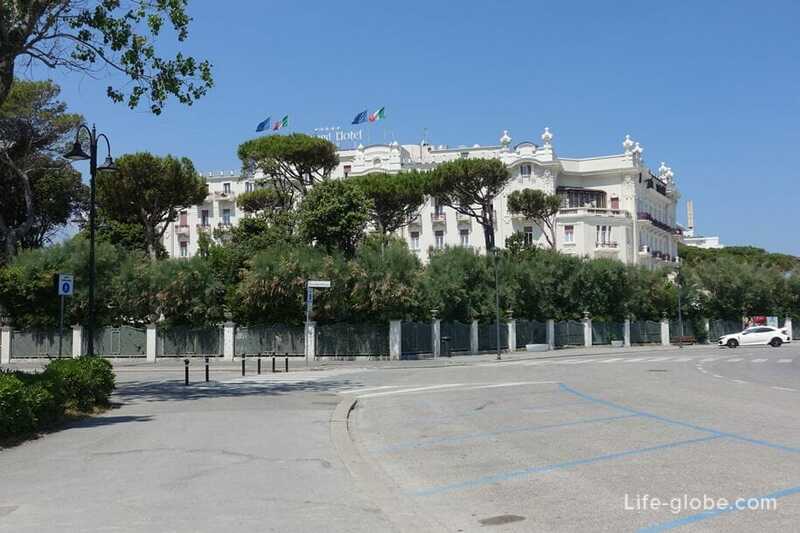 One of the most hyped hotels in the area of Marino Centro area is considered a 5-star hotel Grand Hotel Rimini. 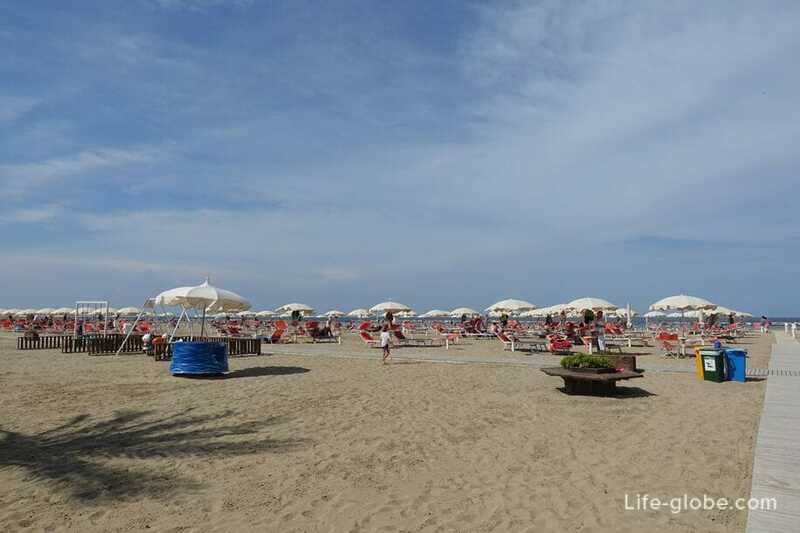 A few hotels located directly near the beaches are from about 100 beach zones. 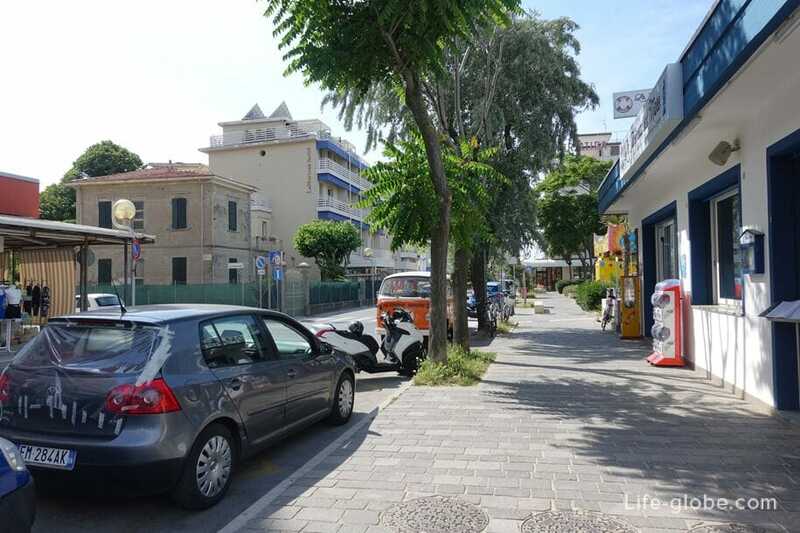 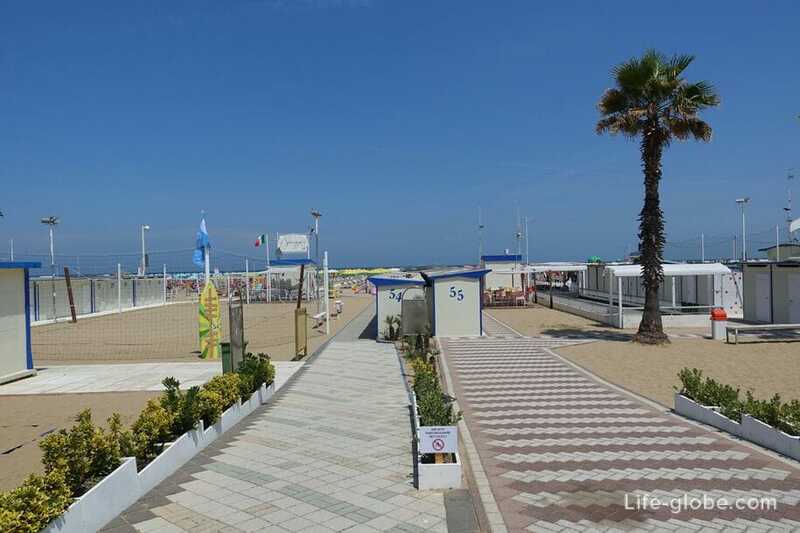 It is at a distance of approximately 4 km from the historic centre of Rimini. 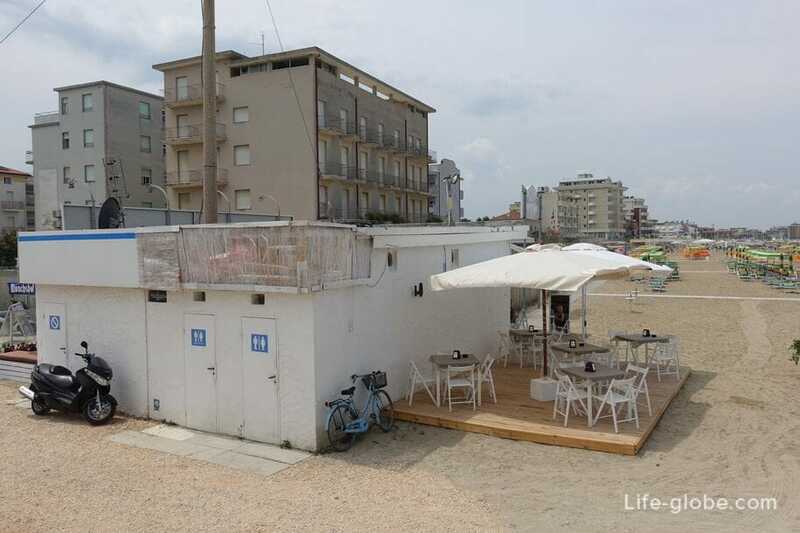 For example, the 3-star Hotel Carlton Beach. 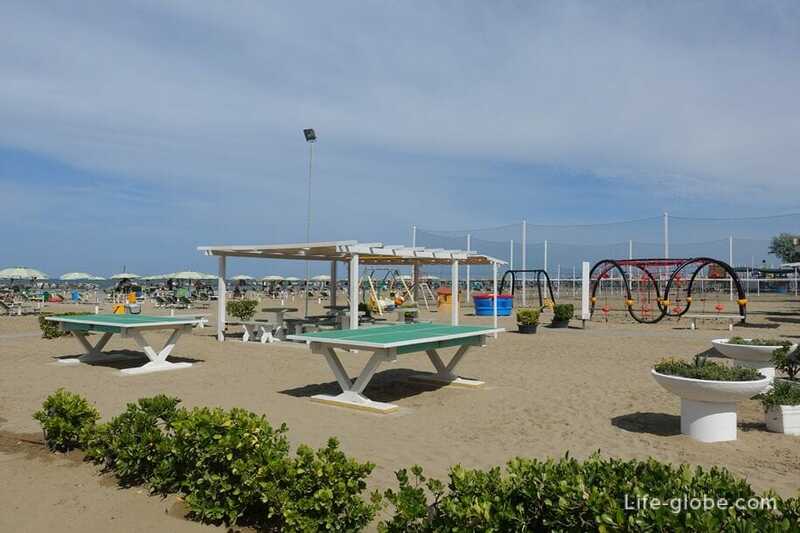 The beaches of Marino Centro are the most popular. 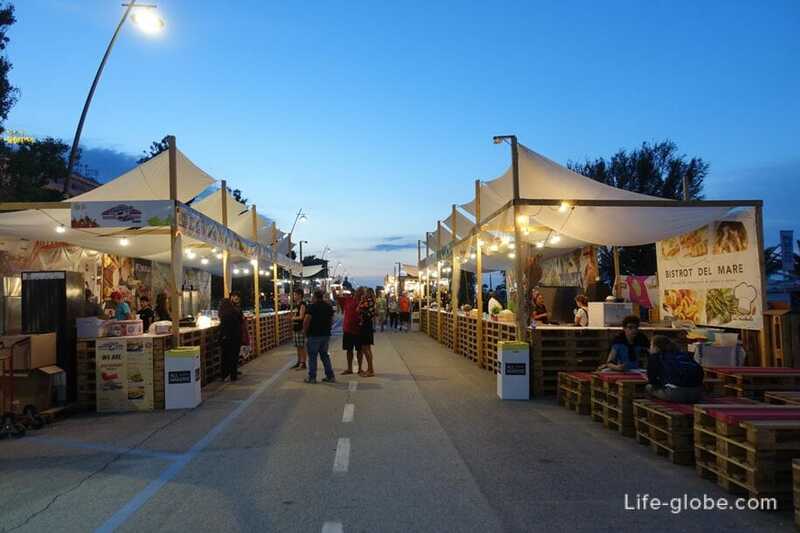 They are located near the historical and tourist center. 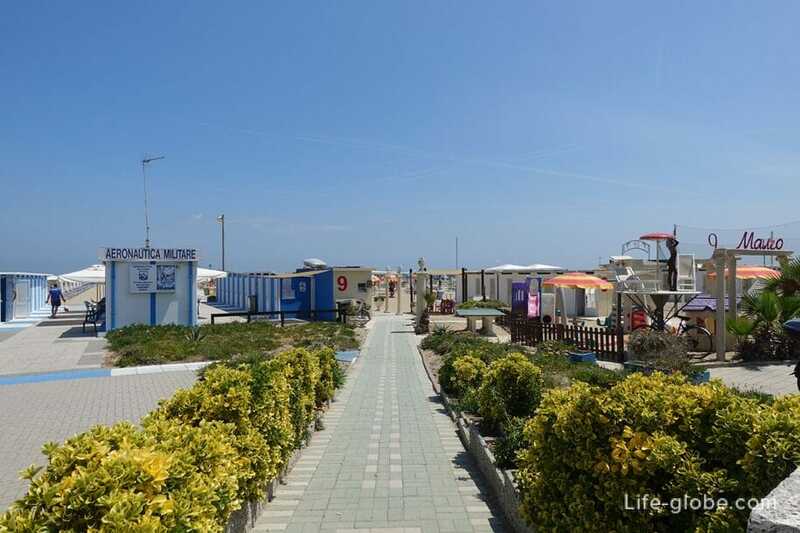 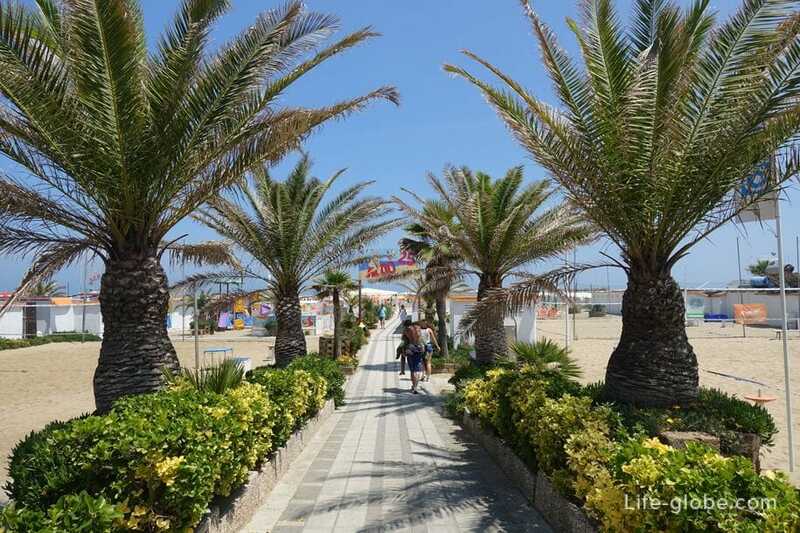 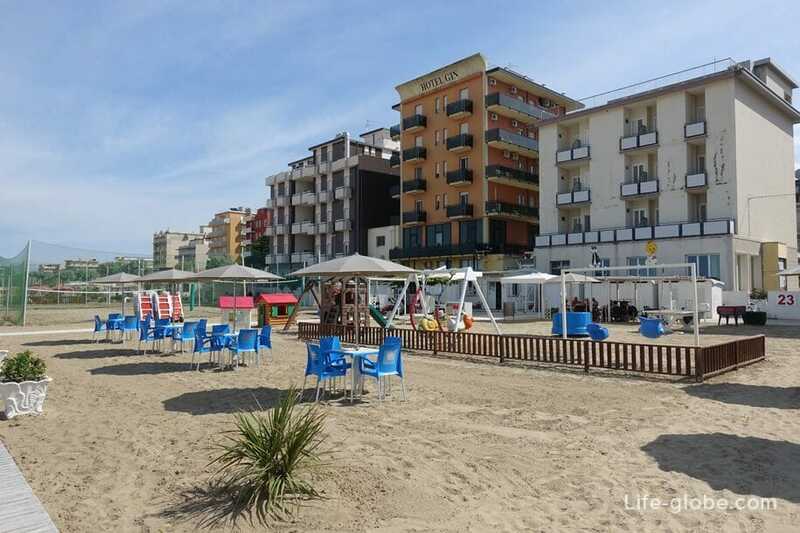 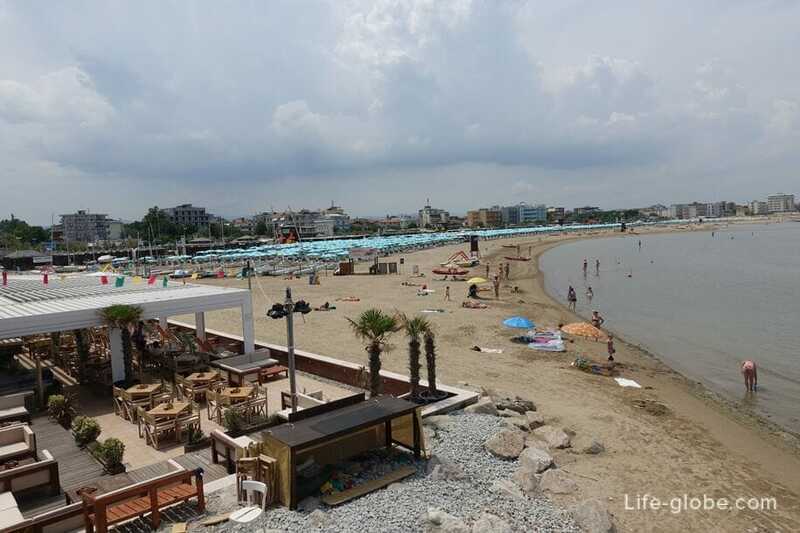 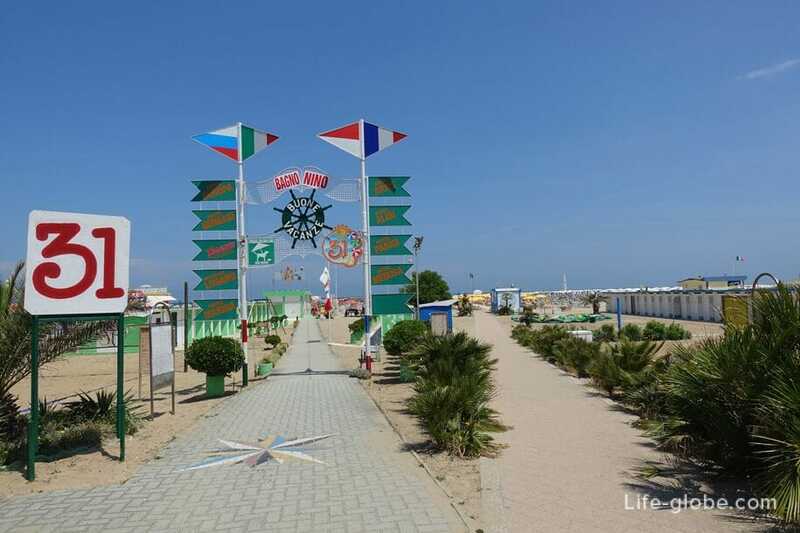 It is near the beach are the main attractions and entertainment: the Park of Federico Fellini, a Ferris wheel, aquarium Rimini and the old town. 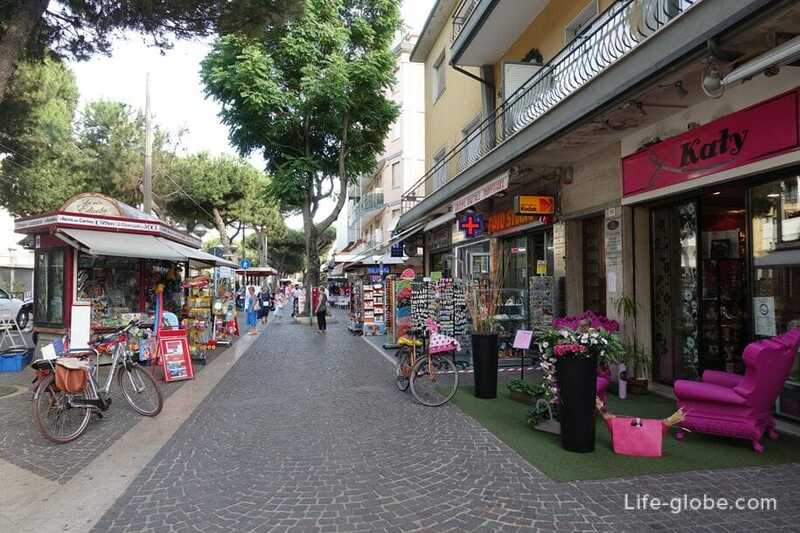 On the street Amerigo Vespucci (Via Amerigo Vespucci), which is slightly above the Central line the beaches of Marino Centro, the festivities and festivals, and even on the street above - ground cafes, restaurants, bars, tour agencies, souvenir shops, shops and retail outlets. 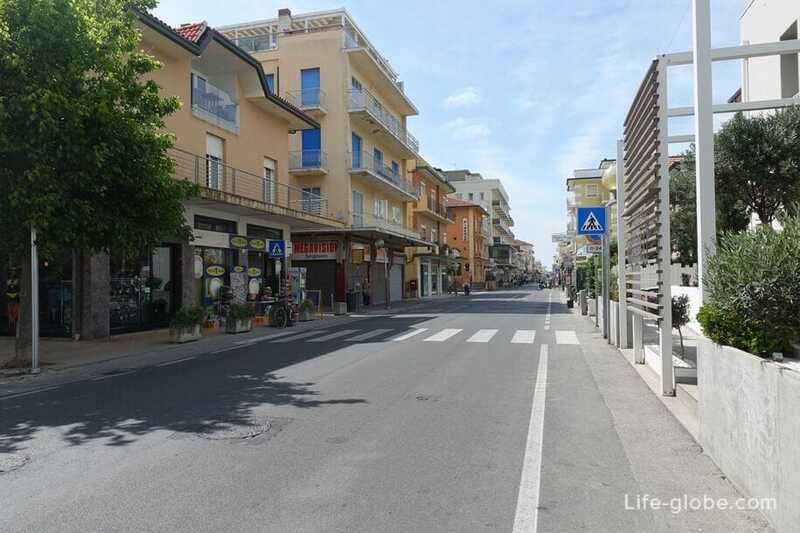 There is a large supermarket CONAD. 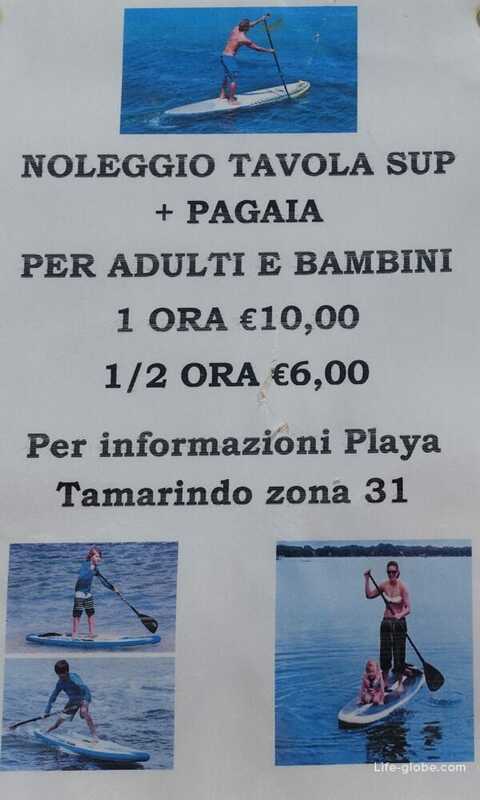 On many beaches water sports on offer. 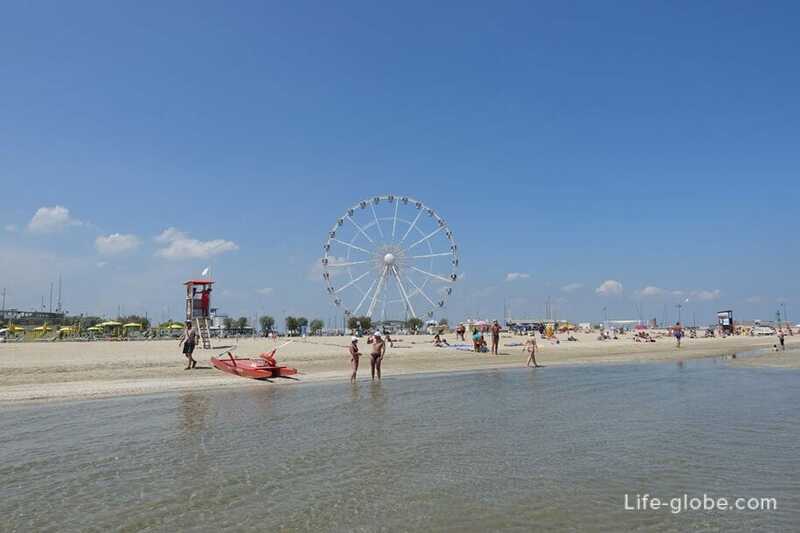 Prices can vary from beach to beach. 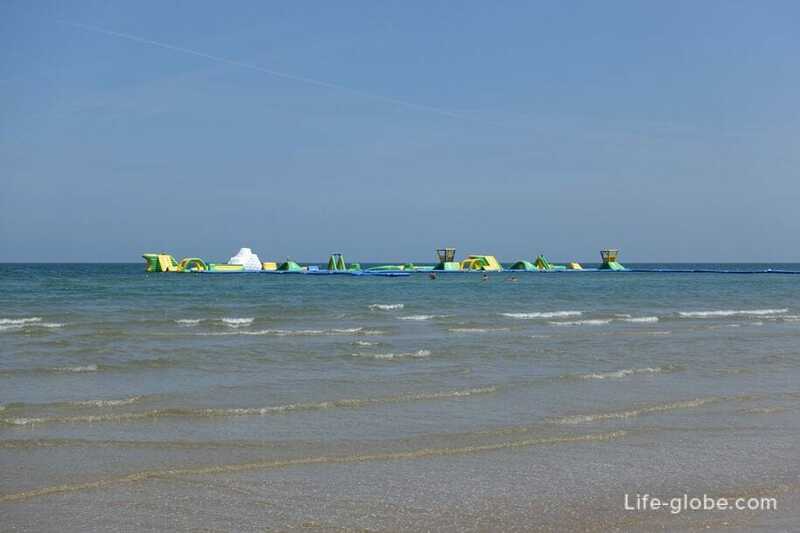 Floating water Park Boabay, consisting of an inflatable modular platforms. 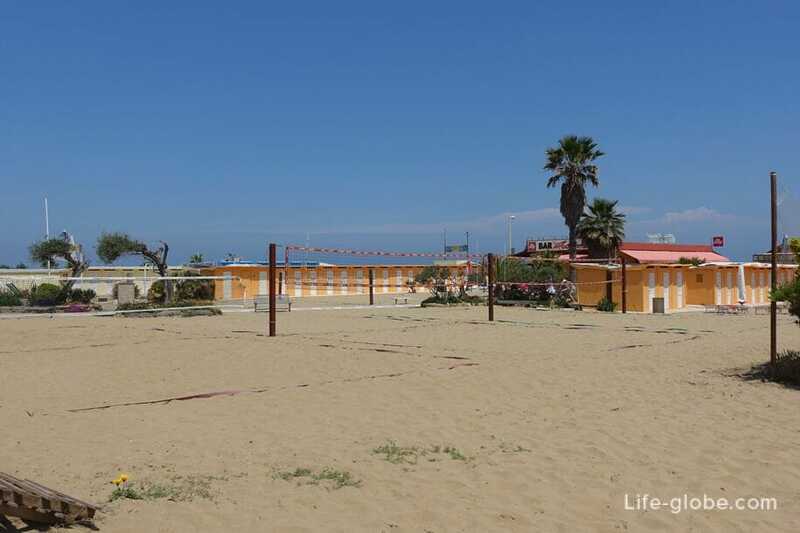 Located in the heart of Marina Centro, in areas from 47 to 62. 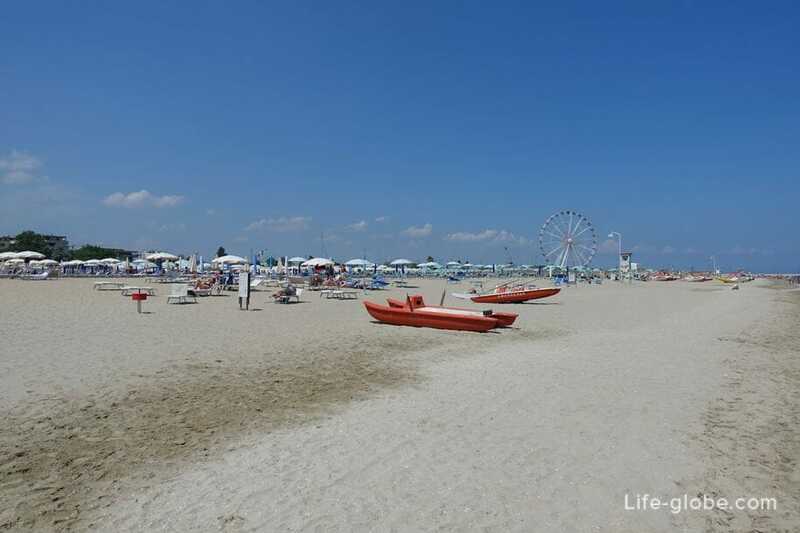 Open from 1 June to 31 August, from 10:00 to 19:00 hours. 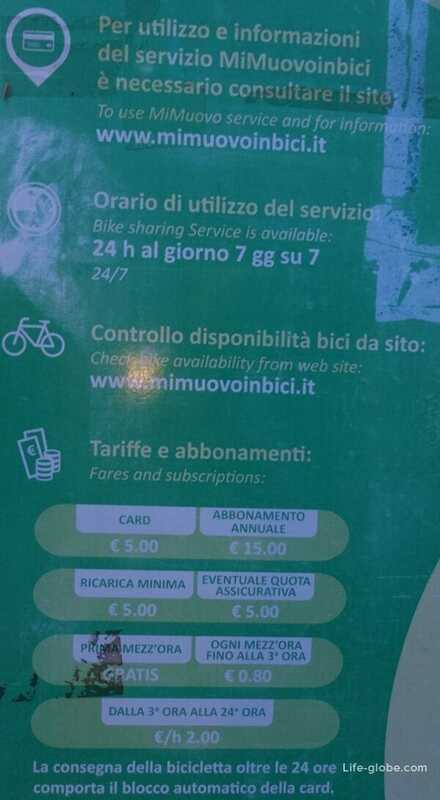 The cost of one hour is 10 Euro. 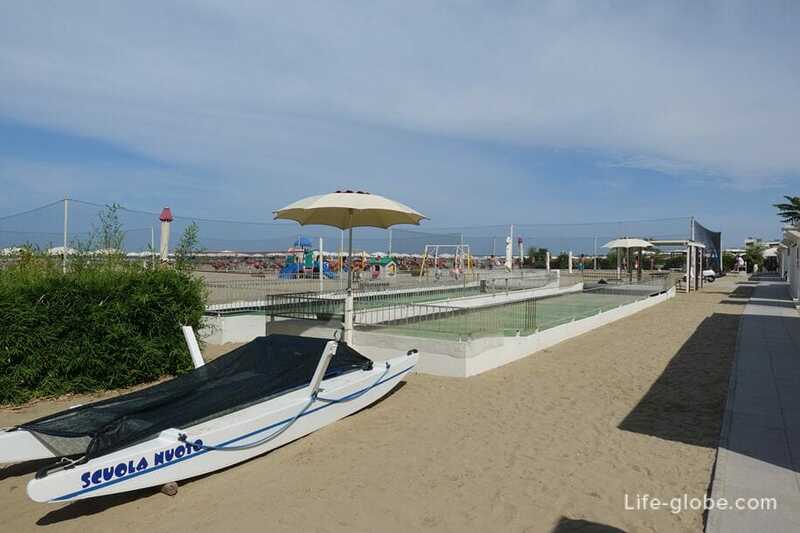 Floating water Park AmareA, is located in the Miramare area, before the areas 143-144. 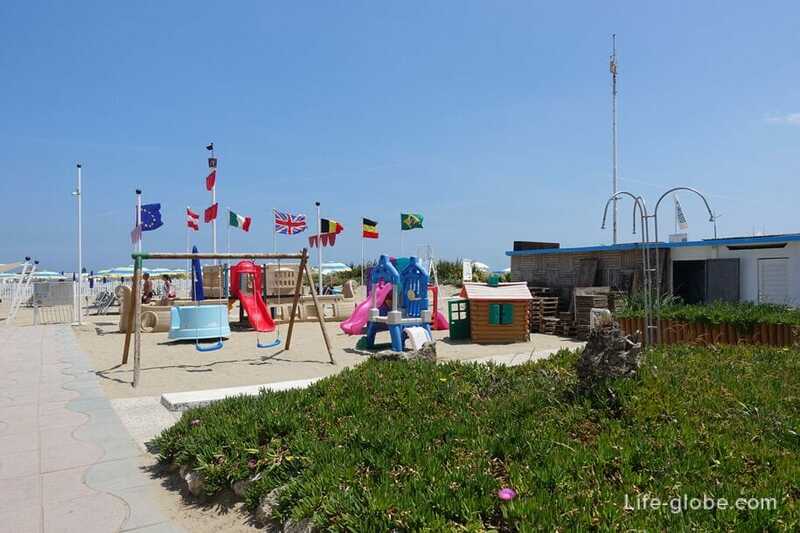 Open from June to September, from 9:00 to 13:00 and from 14:30 to 18:30 hours. 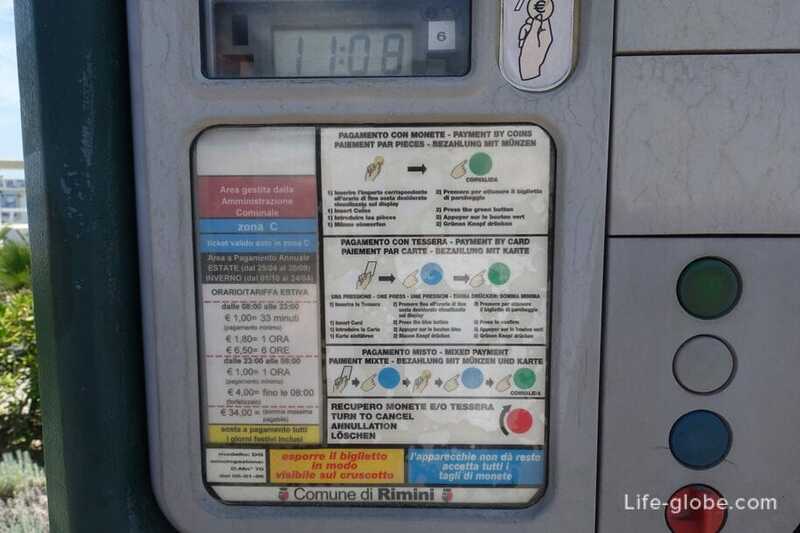 The cost of visiting: 1 hour - € 10; 30 minutes - € 6, children under 130 cm. 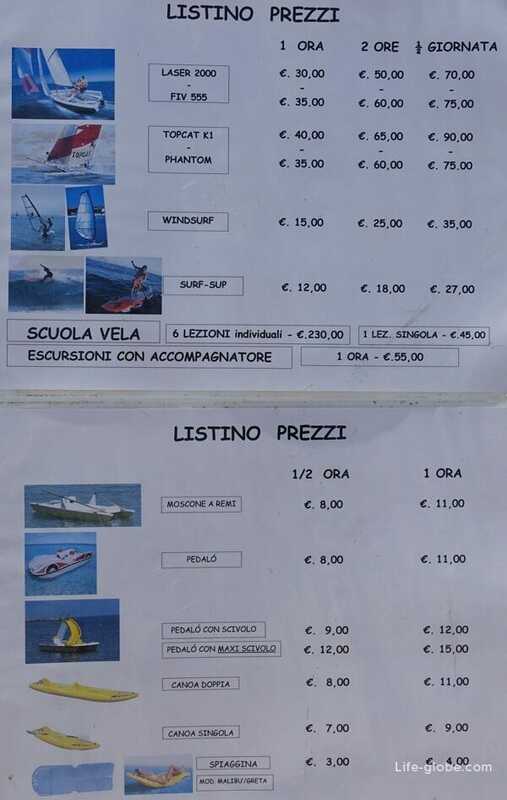 - € 5. 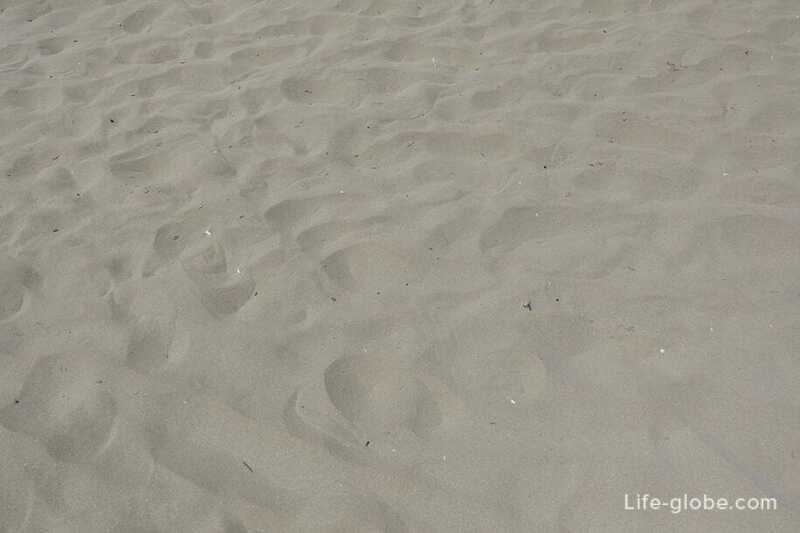 On the Northern beaches No. 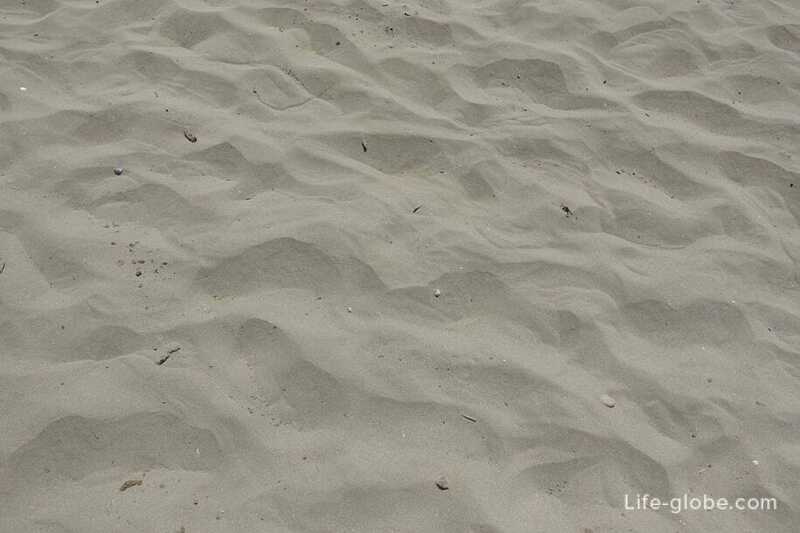 7, 18, 39, 72, and South No. 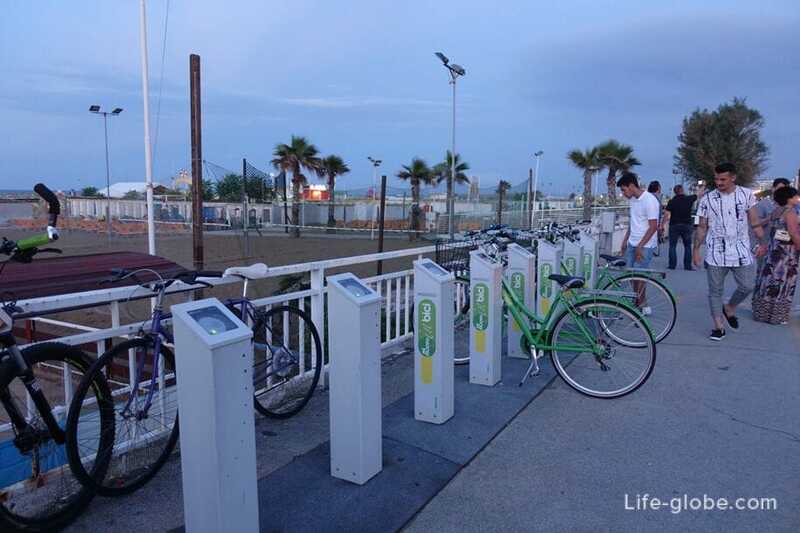 42, 72, 100, 115 and 140 equipped piers, from where everyone take the boats on boat tours and cruises. 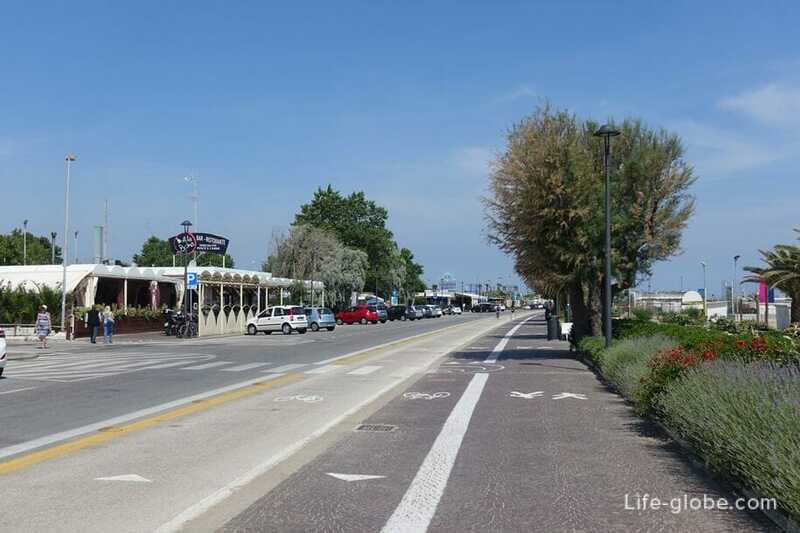 Schedule and prices of cruises can be found here, on the piers. 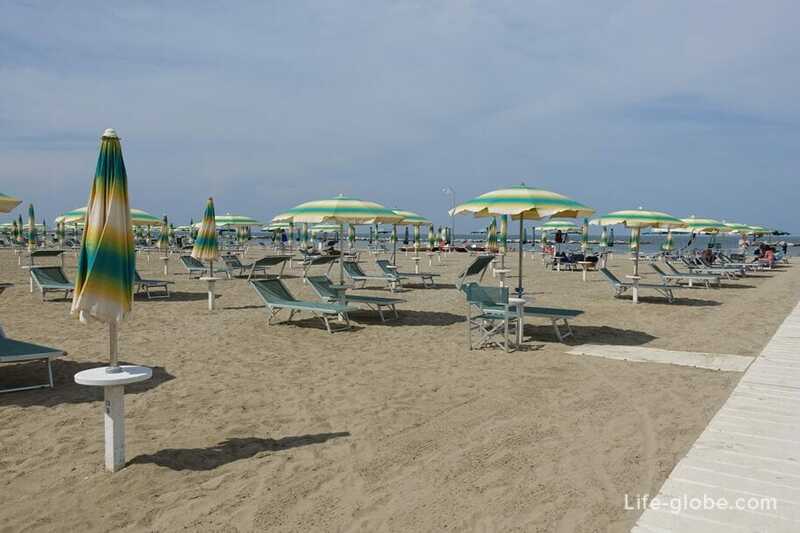 Seasonal, from 07:00 to 20:00 hours. 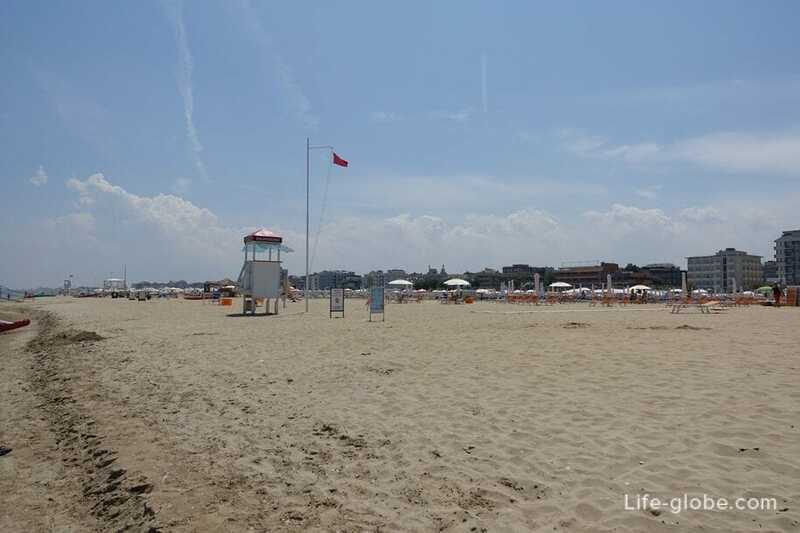 On the beaches of Rimini, along the coast, placed the tower of rescuers with developing above them, the flags, the color of which you can learn is currently the rescue service and what are the conditions of the sea. 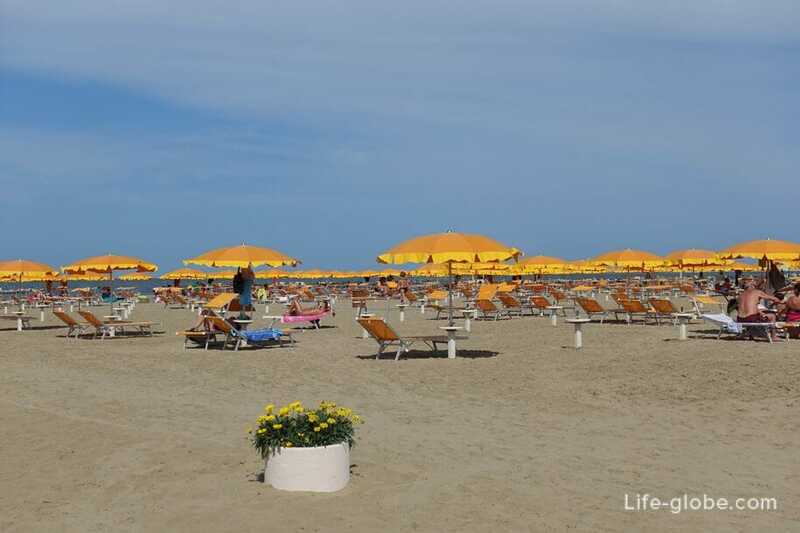 The flags come in three colors - red, white and yellow. 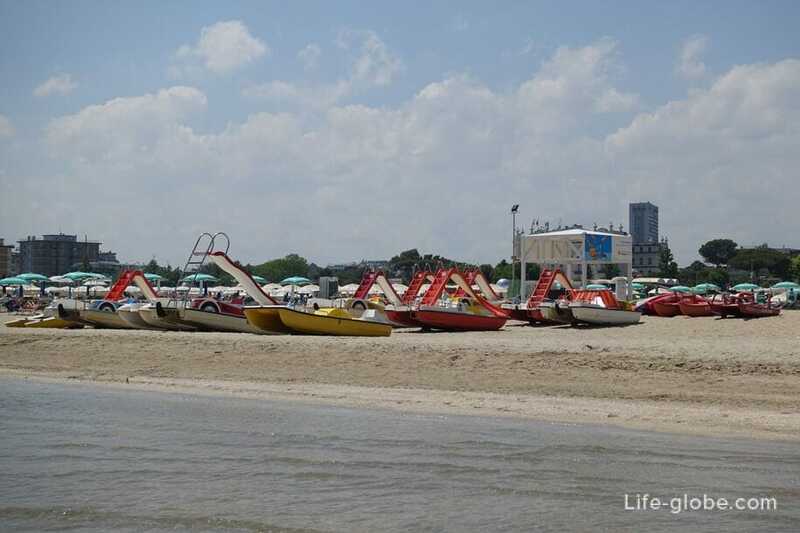 Red - warns about the dangers of bathing due to bad weather conditions or the absence of lifeguards on duty. 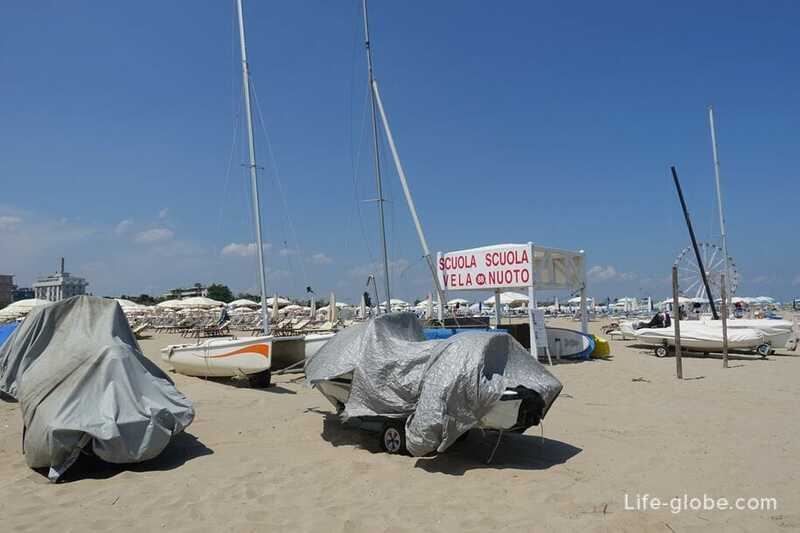 When this flag on the beach, you need to look at the situation, the water in the sea can be calm and inviting for swimming, but lifeguards absent. 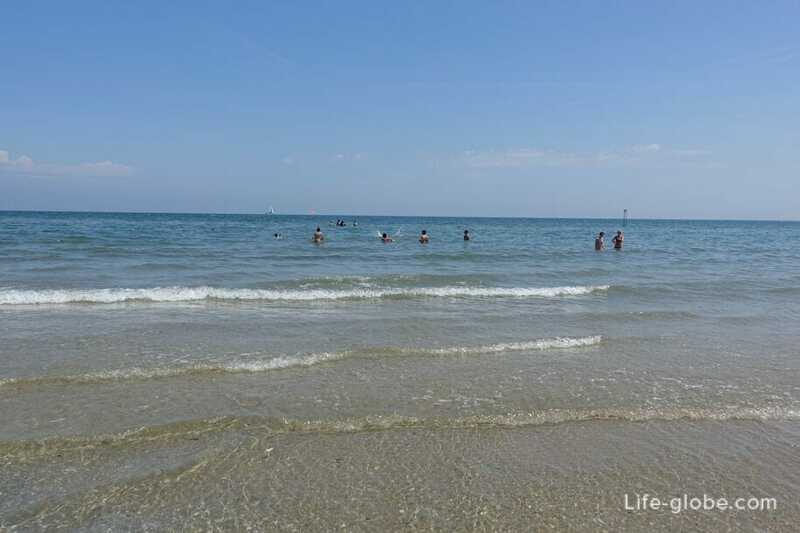 To swim or not in this situation, only you can decide. 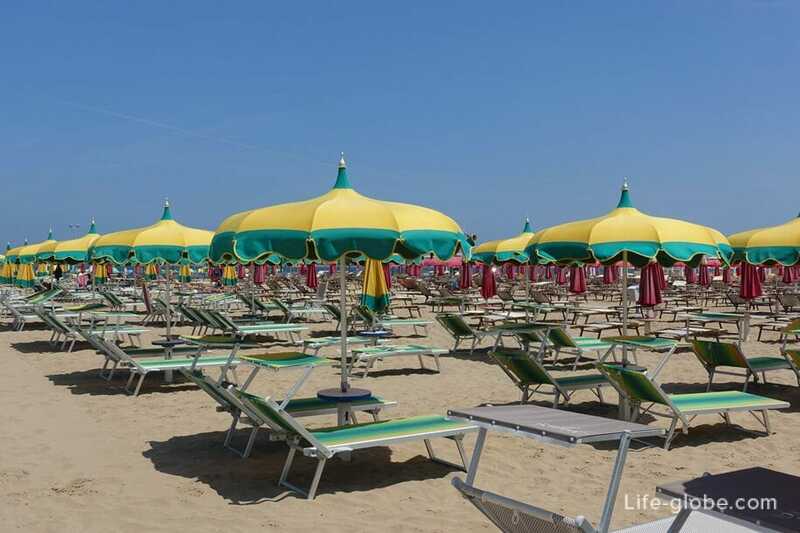 Yellow - set during the strong gusts of wind, and he signals that we should close the umbrellas. 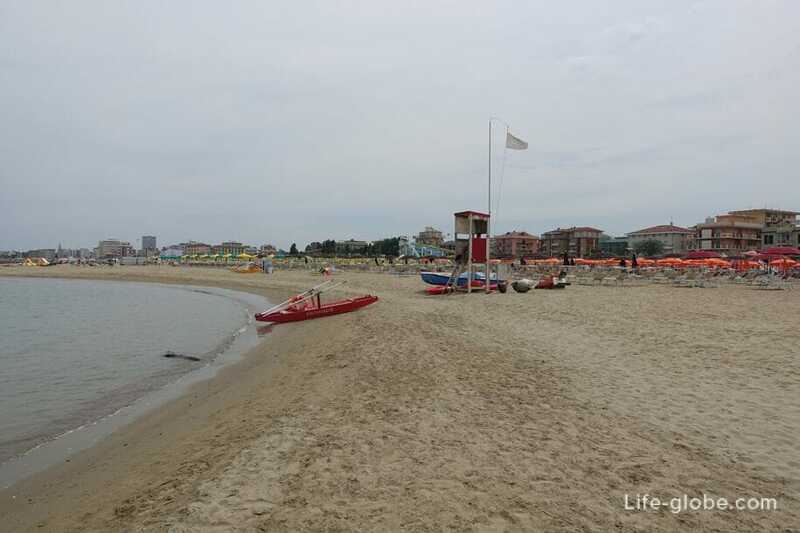 White - suggests that conditions for swimming and relaxing on the beach is nice and the lifeguards in their places.